Oh boy, I've never done one of these before and I'm so betting my formatting is going to be crap, but here we go. Using LastPilot's fantastic Crystal TKL build log as a template, though my camera comes from Idaho (no offense to Idahoans). I will be putting little summations of each section up, but the more in-depth stuff will be viewable by clicking "more." This log itself took a few hours to put together. Enjoy! NOTE: Once I get my Assembly Services page sorted and posted, I plan on offering MX-to-Alps conversions for MX PCBs and hotswap mods for both MX and Alps. It's nothing that you couldn't do yourself with enough dedication and patience fixing any issues, but for those that want someone else to handle it, I'm always game. 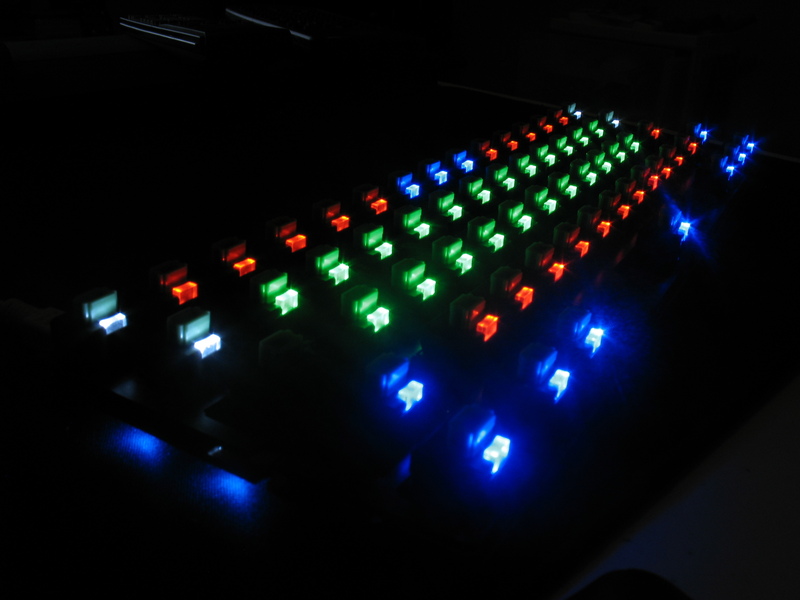 To create a backlit-possible hotswappable Alps keyboard. If 60%, then universal and modular layouts preferred. Ever since delving into Alps SKCL/SKCM, I've been infatuated with that family of switches. I started with SKCM Blue, fell in love with them. Built my Infinity with them, used a few vintages with them. 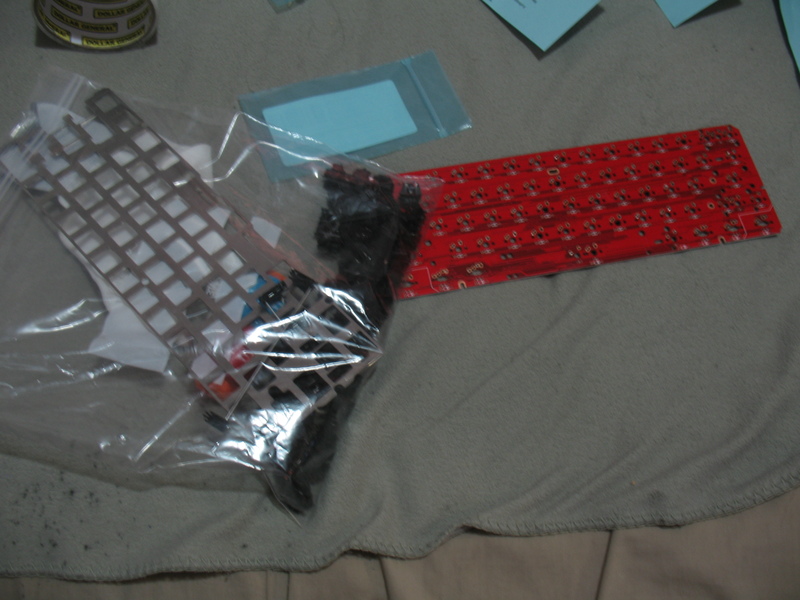 After this, I became really interested in SKCL Green Alps over the prospect of creating a backlit keyboard. Oh, and I also bought a drill press for my dremel as the switch positions would need to be widened in order to use these sockets. Yes, I was literally willing to take a drill to my PCB. 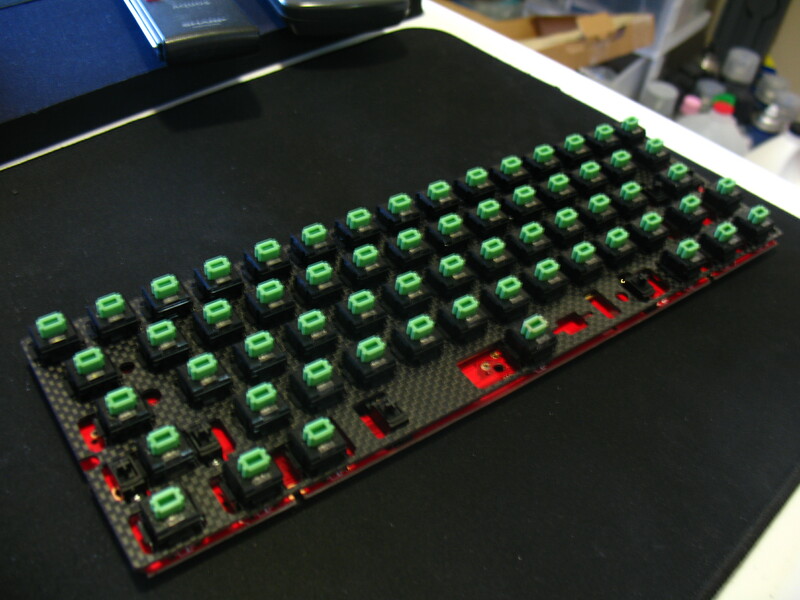 Originally, this began with the intention of making a build with as many carbon fiber components as possible to create an incredibly light keyboard. 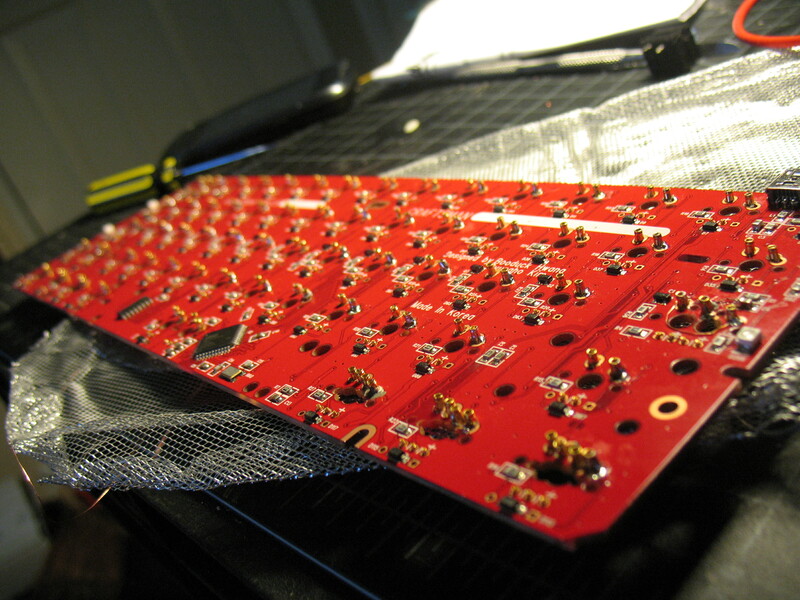 This is still part of the goal as I ended up with two Eagle PCBs, but that part will come into the fray later. Okay, so let's start hunting these parts down! Time to hunt down all the pieces to the puzzle! Okay, so here comes the prep work. As I was originally going for a carbon fiber case, I had originally foreseen using aluminum feet to give the board some angle (I use an Octagon as my daily driver, so I really like angle), and so the first parts I got were GON sky blue aluminum feet from the ever so helpful icyskyz. 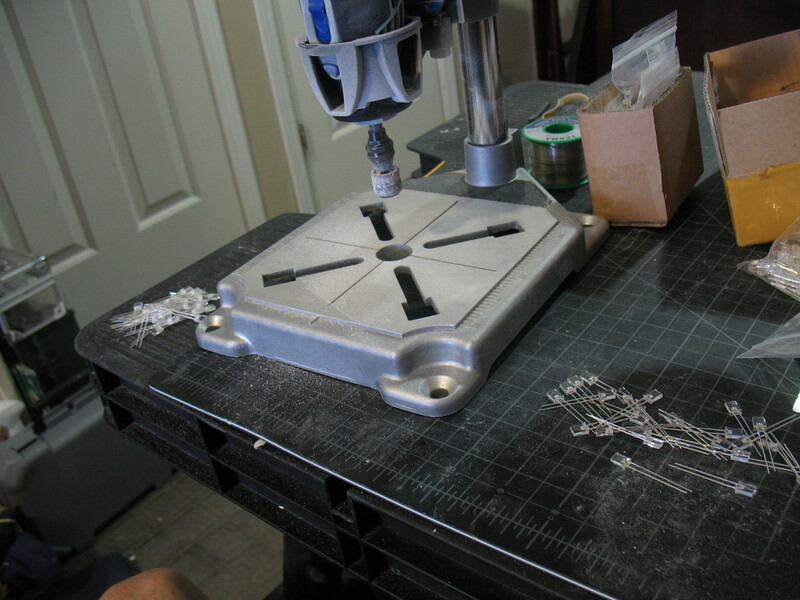 I had sold some aluminum feet I had procured from Bucky for a separate build during a time when I planned on stepping away from keyboards. Cherry MX boards fell out of interest with me, but then Alps came in along with this idea. I sold these to Icyskyz, but then needed some again. Bucky originally had the two colors but preferred sky blue (which is what I had hoped for), he then sold them to icyskyz. So, in the end, I bought the sky clue GON feet from Icy and he got the silver ones from me. After this, I needed the screw-in stabs. Thankfully, the ever-so-awesome Spamray managed to help me out with finding a few! They were the new design with the "mushy legs" on the stab dummies, but nothing a clipping couldn't handle. Thanks, man. You've always been a big help! I also bought some gold stabs from icyskyz. I already had 7u stabs and enough for my build, but I wanted enough for a 6.25u build as well. Thanks to you, Kent. You helped out a bunch! After this, I believe I got the switches. Well, not exactly. I bought a Zenith Z-150 in hopes of getting some greens, but I got some yellows instead. After this, I took up Ludovician's offer to trade me some fantastic-condition SKCL Green Alps that came from a board that seemed untouched for decades. I knew the chances of finding an Alps board this mint would be very slim, so I traded the SKCM Blue Alps I stripped from a Leading Edge DC-2014 (forgot one switch, sorry man ). Of course, how could I forget these! These are the sockets that do the business, and by business, I mean that hotswappable switch and LED goodness that's getting so popular right now! 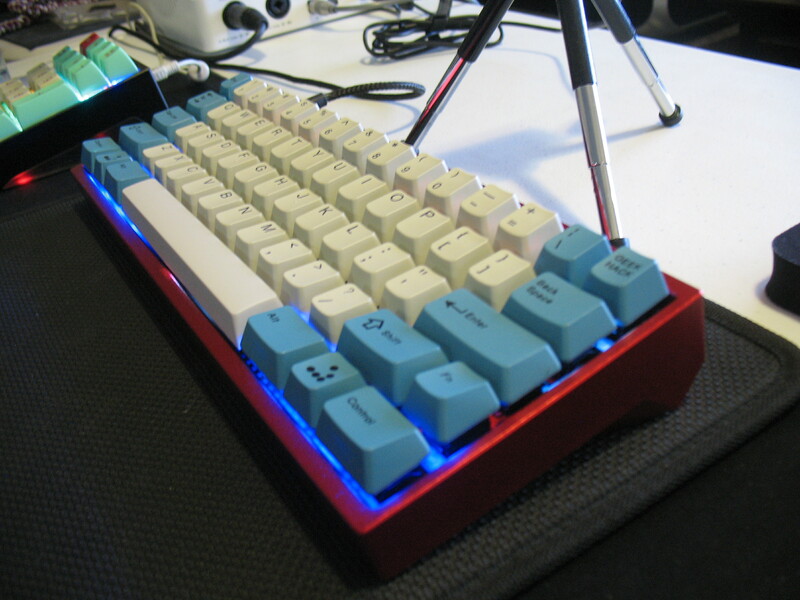 The idea was originally conceived by PopReference for his Winkeyless.kr build, which he in-turn got from the infamous Smart 68. I had talked to him about my idea of doing this for Alps, and we narrowed down the sockets that would work. Ultimately, we settled on these for the switches and these for the LEDs, the former of which would require widening of all switch pin holes on the PCB in order to fit. 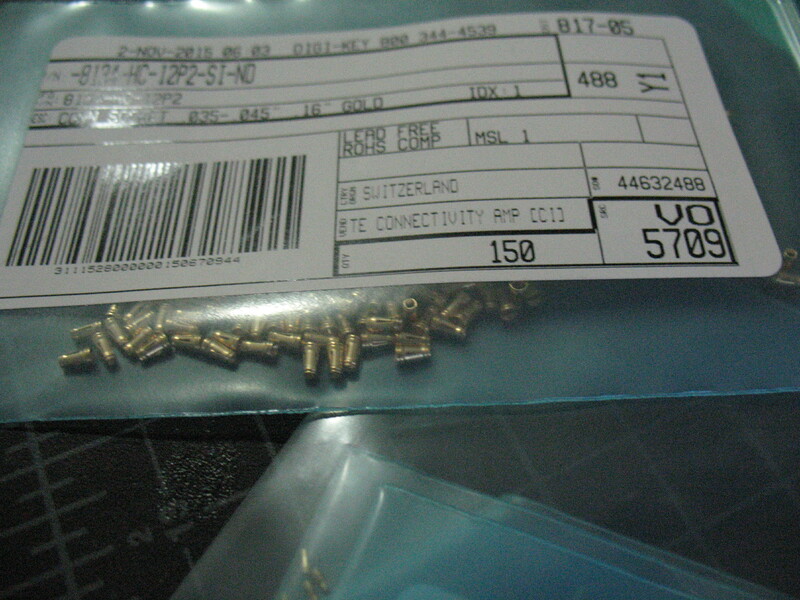 These require no solder to work and sit flush with the PCB! So, this was kinda tricky, but went amazingly well. First, I tried putting out ads on MechMarket and the classfieds here on GeekHack, but to no avail. I then tried messaging someone on the Leeku Eagle/Viper PCB Interest Check page who mentioned not liking their Eagle's PCB much. Deci really helped me out. He offered me the PCB. If I paid the price of shipping. I had to handle the desolder work, but miraculously I managed to get all of the Cherry MX switches off his board without a single pad lifting. Duck PCBs have never had good reliability in that area in my experience. Before this though, our terms for the PCB kinda fell through and the mega awesome bweeldreyer offered me a brand new never touched Eagle PCB for $50. Then Deci came through like a champ and I ended up with two PCBs! This is where it gets tricky and where a lot of people would have told me it couldn't be done. Sure, BlueNalgene's Alps GB could have provided a plate and PCB, but these veered slightly off of my mission goal as they would not provide a universal layout nor backlighting. I still love your PCB's, Hasu. 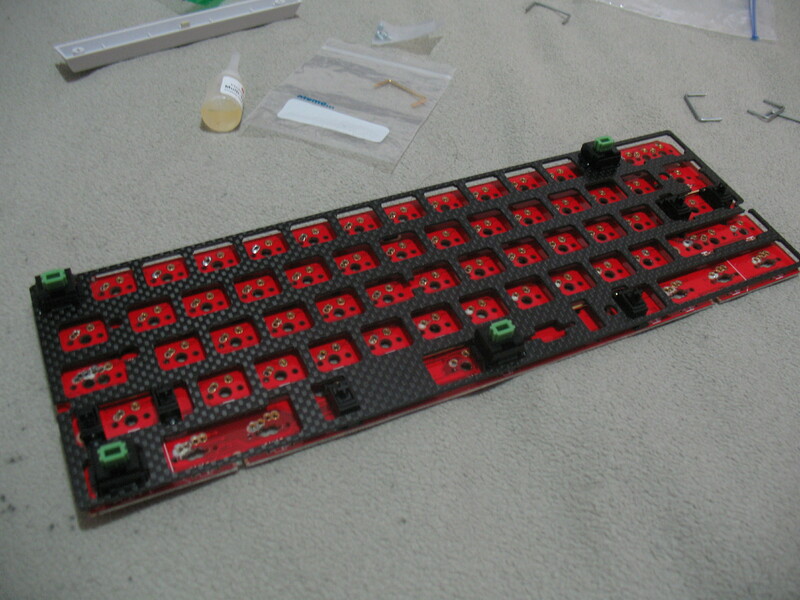 So, this is when my mind got jogged and I had a "holy ****" moment when I remembered seeing Leandre's 60% plate sales advertised on Reddit and noticed the carbon fiber plate and how its universal design by JDCarpe allowed Alps switches to fit into the plate. As I'm sure LeandreN knows, I practically begged for these when I missed out on the original batch. 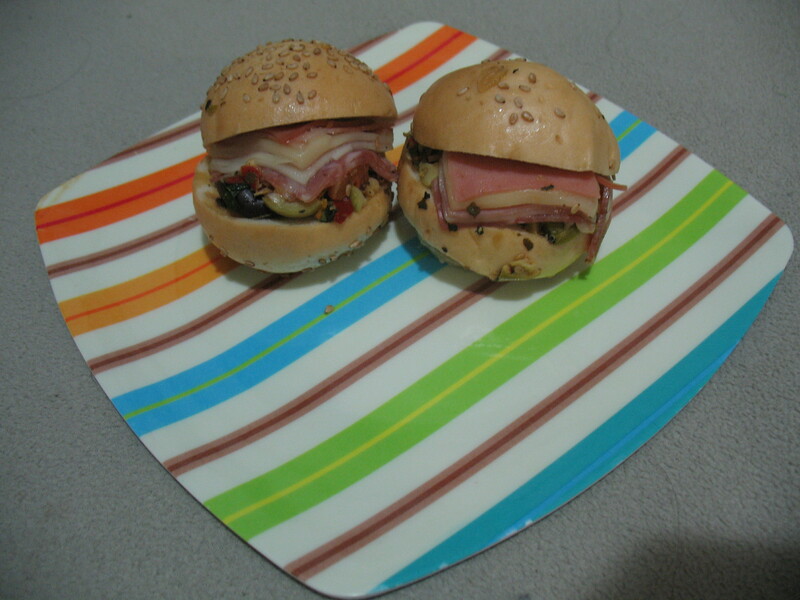 Luckily, opportunity landed upon me, and I was able to secure two plates! This was perfect! Not only will it work for my Alps build, but I'll be able to try out an exotic material which has seldom been in builds to date. Sweet! Thanks LeandreN and JD for the plate and design! So, this was also another weird one. Originally, I was planning on just getting a case from HeedPantSnow once he was done his awesome carbon fiber keyboard base project. When I had landed two PCBs, I thought of just getting two or maybe an acrylic case. Then I had just jokingly said that I'd do anything for a red Hammer case in the Alps Party thread, and what do you know, I suddenly have the opportunity land in my lap, courtesy of JDCarpe. Thanks a lot, dude! 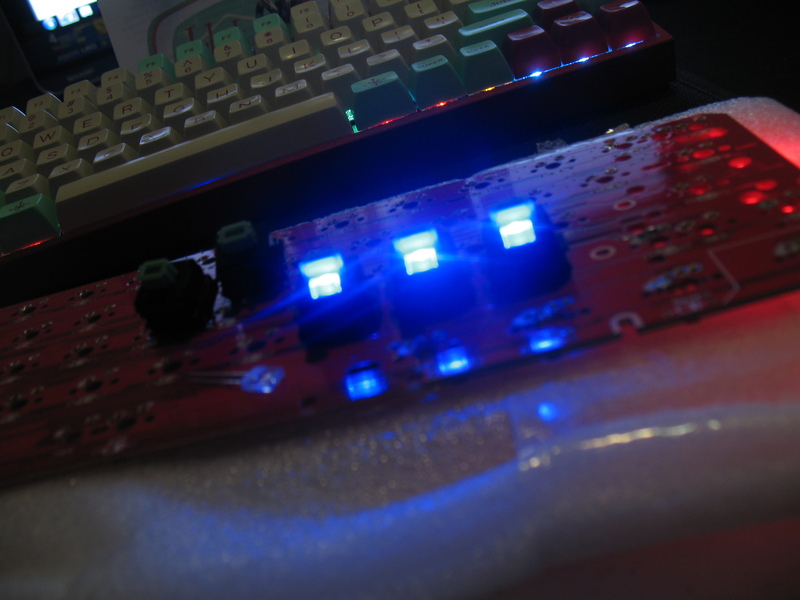 I decided I wanted to use form-fitting LED, so I bought some LEDs in the form factor intended for Alps switches. Rectangular 2x5x7mm LEDs in 9 colors. I bought 60 of each color. 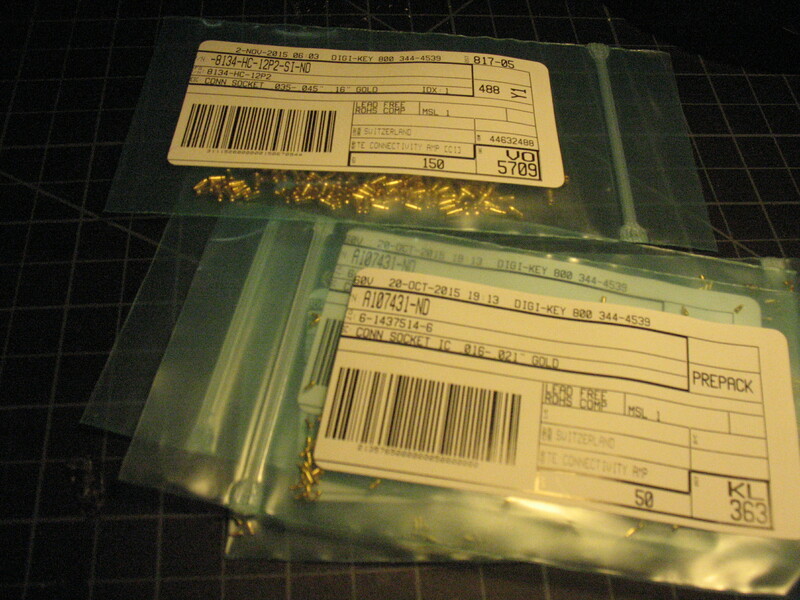 Also purchased a pack of 0805 SMD LEDs to customize lighting for the bottom LEDs. A very important part of this build was Badwrench's Alps DCS Modifier pack. Thanks to SP's misprint issue, I had enough for these two. I'm also glad I picked up the additional standard layout pack option!. Beyond this, I had a few options from boards I stripped of their switches or others that had met an unfortunate fate (RIP NTC 6151N). I had caps from an AEK, my NTC 6151N, and I even bought a Dell AT101 w/ Salmon Alps specifically for this build. I ended up feeling for the AT101 and restored it instead of taking its caps. Ultimately, I went with the NTC 6151N caps for the Eagle in the 104-style Standard ANSI layout. I used some Grey doubleshots that I got as part of a trade from sth on the HHKB-style Eagle. 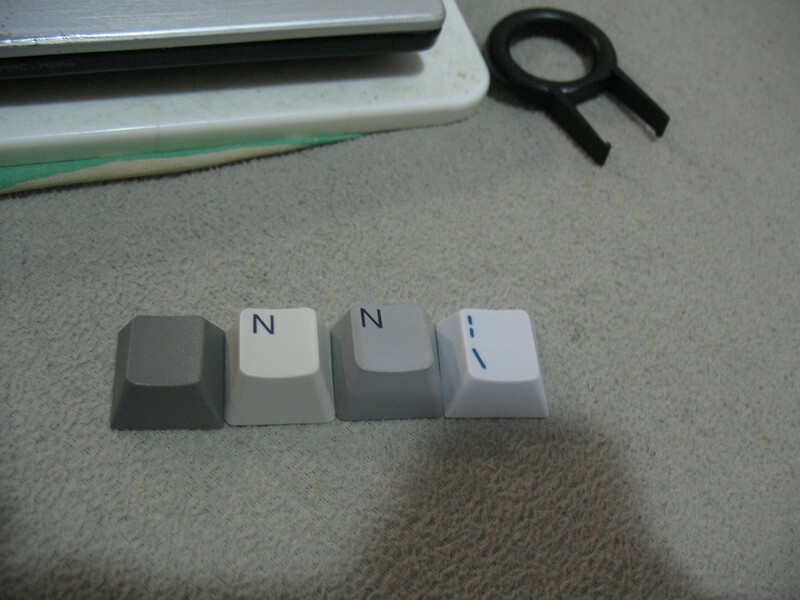 In the future, all black blanks (or Infinity DSA), Lastpilot's Graphite replica set, and Alpine Winter are all options. For the space bars, there were no options, so I had to perform a stem swap for this build. 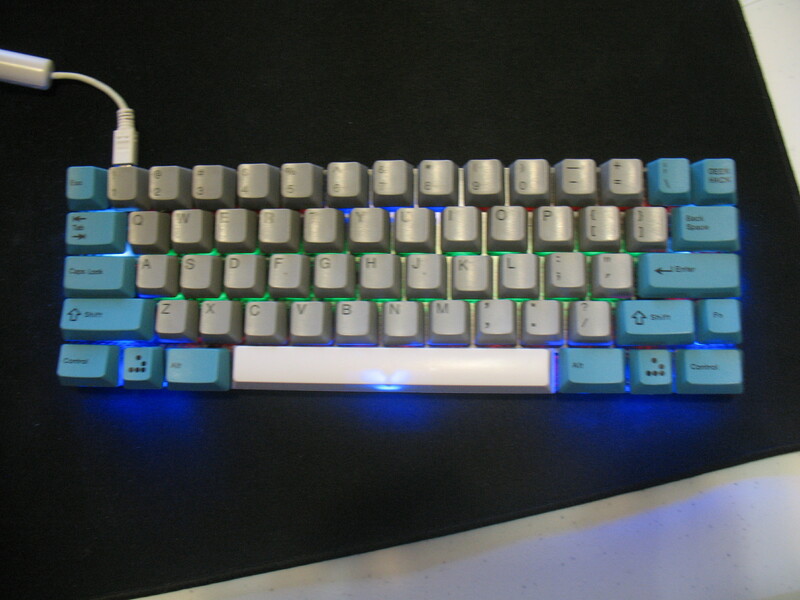 I used my Gateron 7u PBT space bar and a 7u GMK Triumph Adler space bar courtesy of eksuen. Stems were taken from the junky caps my FAME originally came with and some caps from a Zenith Z-150, both ABS. The 6.25u space bar came from the Tai Hao Olivette Alps set, which miraculously had Cherry mount stabilizer stems. I bought some long 15 foot mini USB cables for using to make more custom cables for my Octagon and Lightpad (still haven't made one for the Lightpad ). Since I already have one for the Octagon, I used a cable for the Eagle instead. 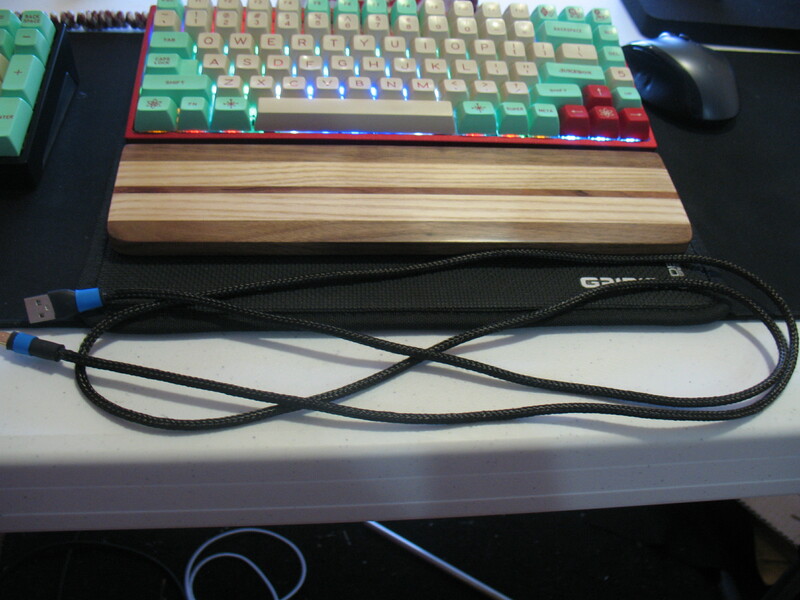 Then I bought some carbon fiber sleeve for sleeving the cable as I had wanted to make a fully CF build! Gotta be careful with this though, since it is conductive. You don't want it touching any of your pins. I also had some shrink tubing left over from other cable builds. The black was a bit too big for the mini end of the cable, but it worked out. Traded crazy sth 63 SKCM Blue Alps for 40 linear brown Alps + the grey ABS doublehshot caps that now adorn my keyboard (love them man)! Bought an Apple IIc A2S4100 for some Amber Alps. Absolutely hated them. Had an assortment of switches laying around from other keyboards. Blues, Oranges, Yellows. No big deal. I already spent $100 $165 on the holtite sockets. There's no going back now! I bought a drill press for this expressed purpose. I had to be sure my drilling would be as steady as possible so I didn't royally screw something up. 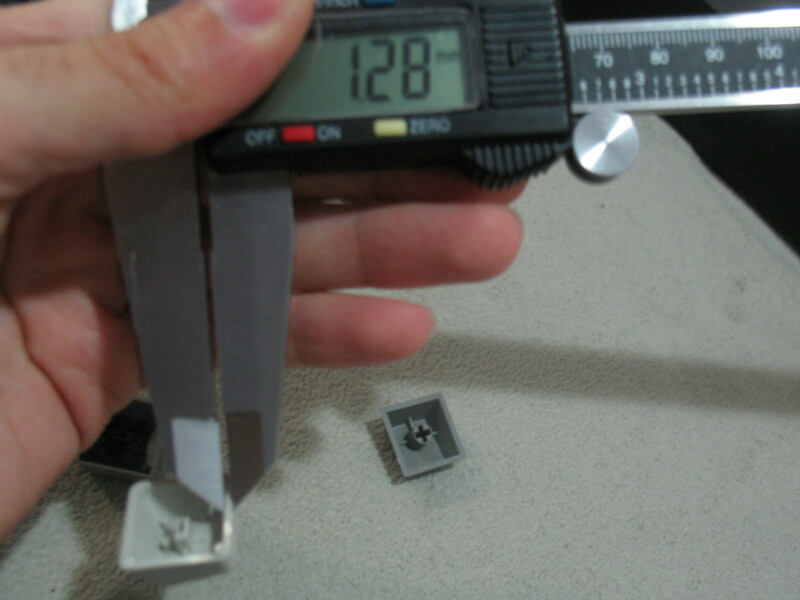 Since the tin-plated holtite sockets came in first, I tested one position with them. This is an example of my impatience giving way to impulsive behavior! Worked like a charm! 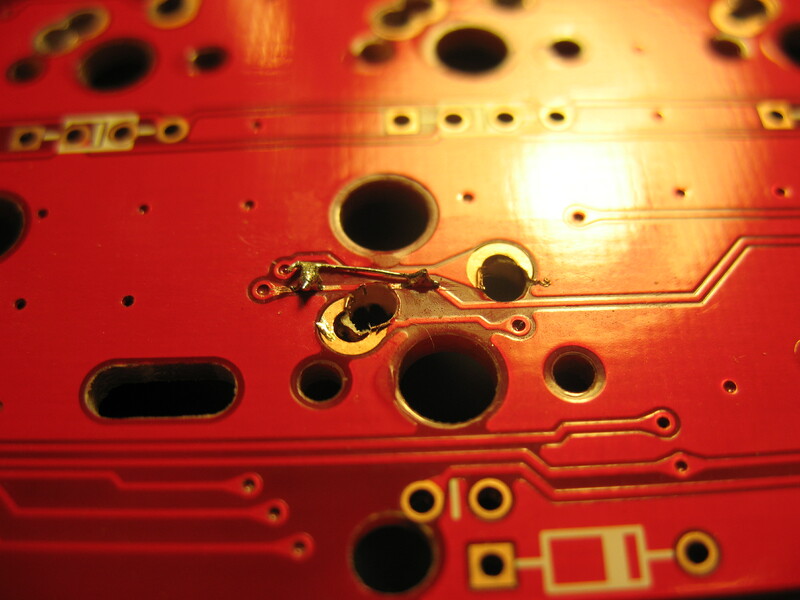 Er, but I have to get this out now, because THIS is the brand new PCB and I -want- GOLD in it. Well, it worked, but it was scary to pull out. 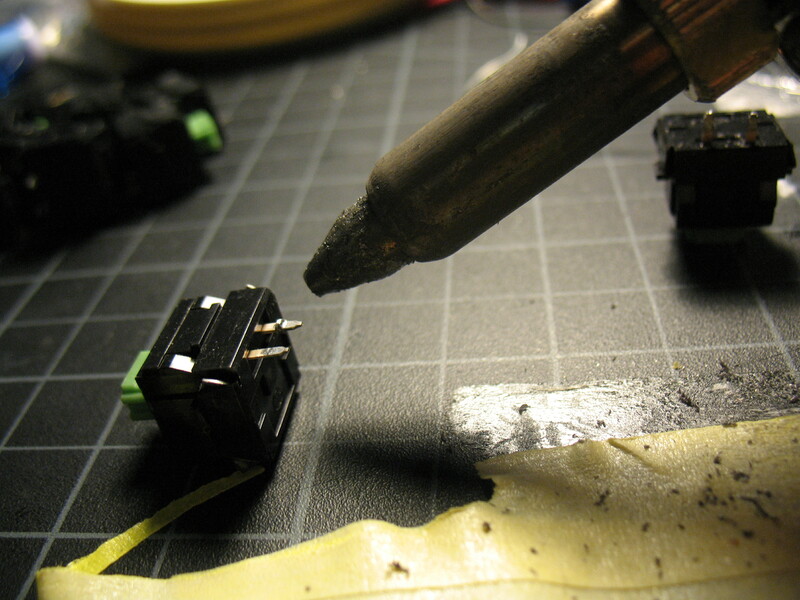 PROTIP: Use a soldering iron to heat the socket up when inserting or removing. Guess what came in like a day or two later? My brand new scalpel. American-made. Surgical steel. Made to last a lifetime. Oh but it looks so pretty; stop preaching heresy, you parenthetical information, you! So sparkly and bedazzling, dayum. <3 Okay, but it's time to get back to business. These things are tiny, and I only have enough for a few mistakes, so I can't fuhq up too many times without grave consequences. I counted 73 possible switch positions on the Eagle, so I just multiplied that by two for the sockets. I did not account for the fact that the Caps Lock position had THREE positions: Non-stepped, ALPS stepped, and Cherry stepped. Alps stepped is not the same as Cherry stepped. It's pretty much in the middle of both. This meant I had a wee bit fewer spare sockets than I thought. I actually had more LED sockets since I forgot that the multiple layout positions only used one additional socket, not two. The Caps Lock position had four total. Anyway! On with the pictures! I know, it looks like my poor PCB is sitting in a torture room. 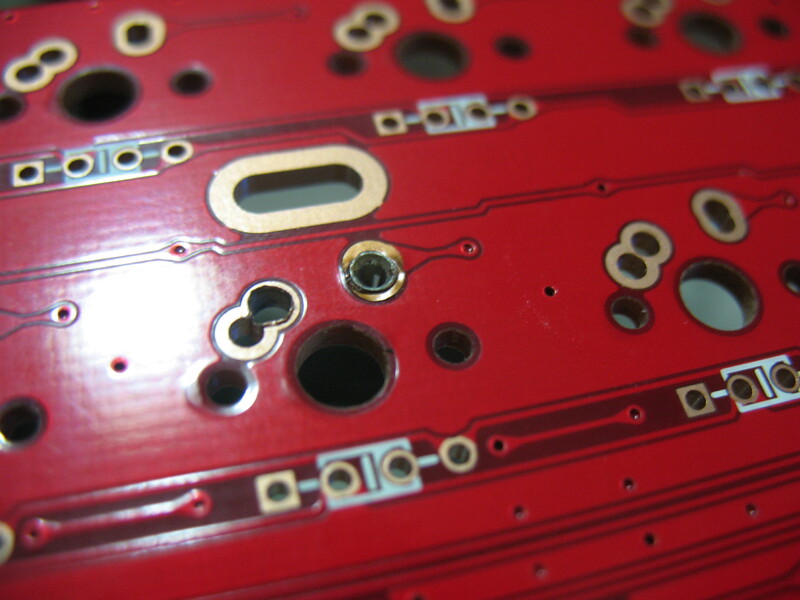 DRILL TO THE PAD IF YOU DON'T SHARE YOUR SECRETS, PCB! 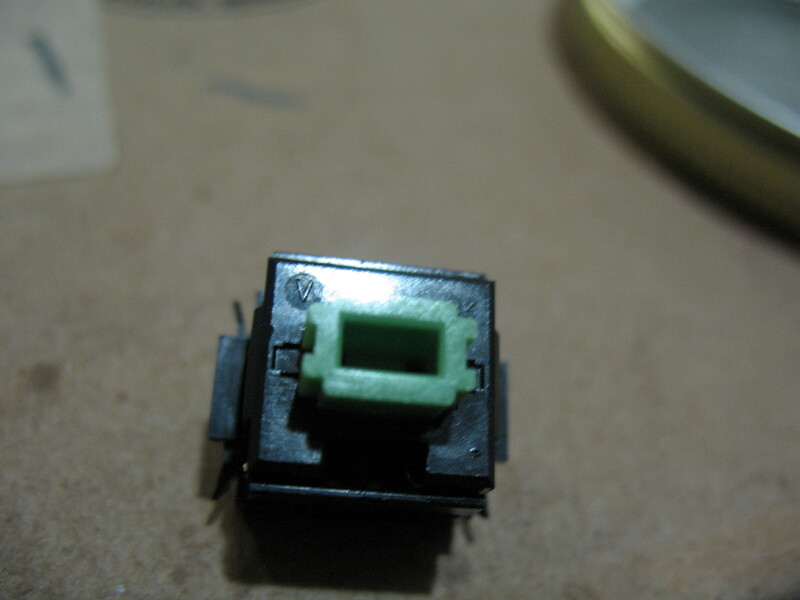 One thing that's very important to realize about Alps and the Duck Eagle PCB that you should seriously consider if you ever decide on doing this or just using Alps in general on an Eagle is that the Cherry MX switch positions are not 1:1 with the Alps switch positions. I mean this in terms of the actual layout offerings. You are pretty much stuck with a modified Dell AT101 / SGI Granite layout with the only alternative option being a 15u number row (HHKB style), but no short shift + 1u and no 6.25u ANSI bottom row, and no Cherry-stepped Caps Lock. 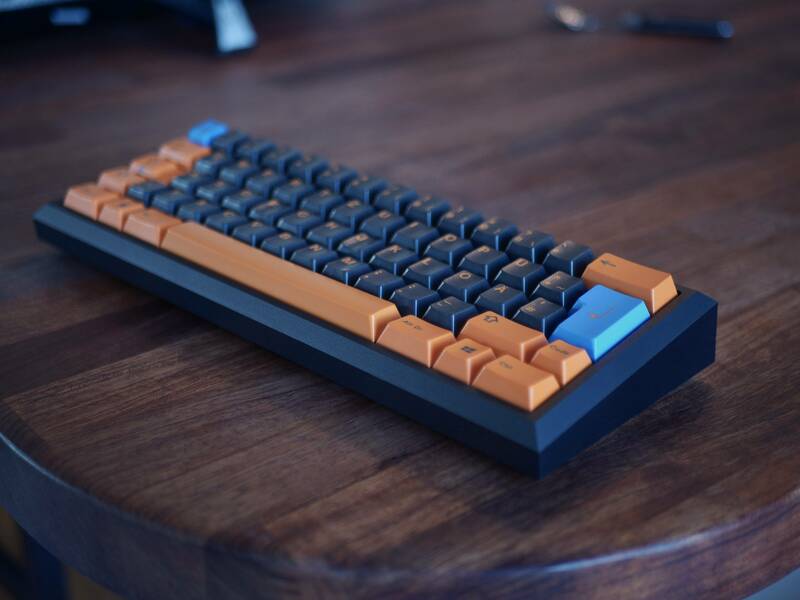 Personally, I think this is a little short-sighted since Alps boards had some of the most varied layouts out there and could have worked with the HHKB layout and such. I threw limitations to the wind and realized that I had a drill press. So, upon this great realization, I decided to make my own options. I drilled out positions for every layout available, including the 6.25u ANSI layout, the short shift + 1 layout, and the Caps Lock positions. I didn't notice the Alps stepped position until way after since it looks really strange and only has a fraction of a pad touching each position, so it was easy to miss. As you can see by the picture above, I had to repair and rewire some traces. The caps lock position was a unique situation where I actually had to reroute and cut a trace or two to get it to work, but it does indeed work. After widening all the holes and creating the extra positions myself, I started slipping the sockets in. I would recommend a wide-nosed soldering tip for this. The last thing you want is your 300C soldering iron to be digesting your PCB as the tip gets stuck in a socket it after pushing it in. Trust me. You don't want that. And done! Kinda... (I wasn't expecting it to work like magic when I was done anyway. ) I had to remove several sockets from the custom switch positions due to my lack of awareness of the copper beneath the solder mask acting as the ground plane. I'm a tinkerer, not a circuitry enthusiast. So, I removed them, used a mill bit on a very low speed on my dremel to remove the copper from the areas and then reinserted the sockets. I used epoxy putty to rebuild any areas I mucked up and used conductive ink to repair any delicate traces where solder would've been impossible to use. On some occasions I used thin wire as seen above. 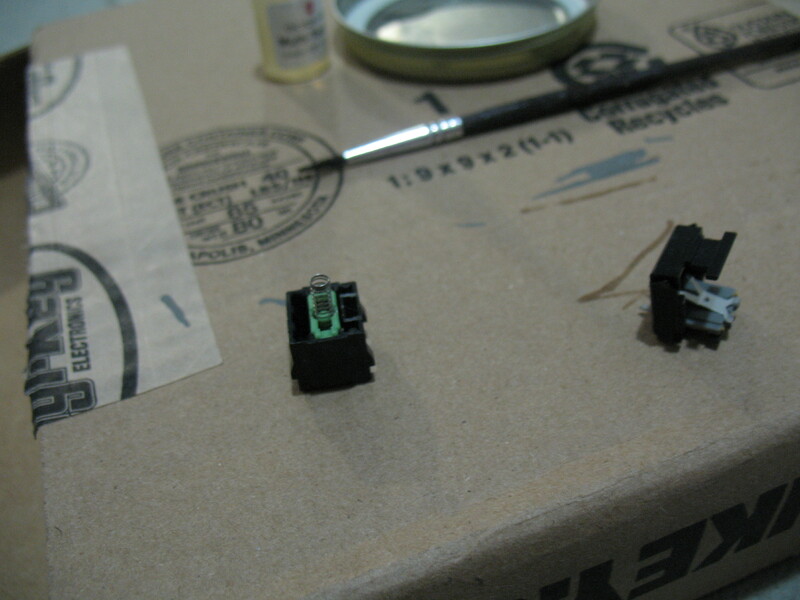 I also coated any bare wire I used in acrylic black paint via a gundam paint pen just to make sure it'd be insulated. 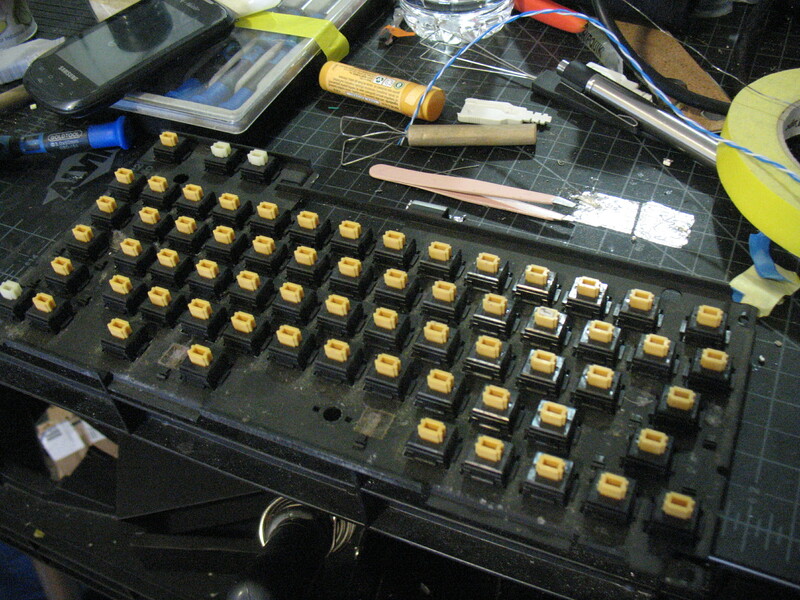 Here, you can see the rewiring I did for the Caps Lock switch. Because of an oddness in the way the pads were set up (not even sure how to describe it, but there was a conflicting position when the stepped position was used), I had to cut the trace on the left-most position, rewire it to the ground plane which the right-most position is also connected to, and then just make sure everything was connected right for the adjacent pads. The first time I did this, I forgot to check the other side and cut the trace going to the row on that end. Everything worked out in the end, but in the beginning, this caused the keyboard to start the bootloader every time it was plugged in. Deci's PCB! 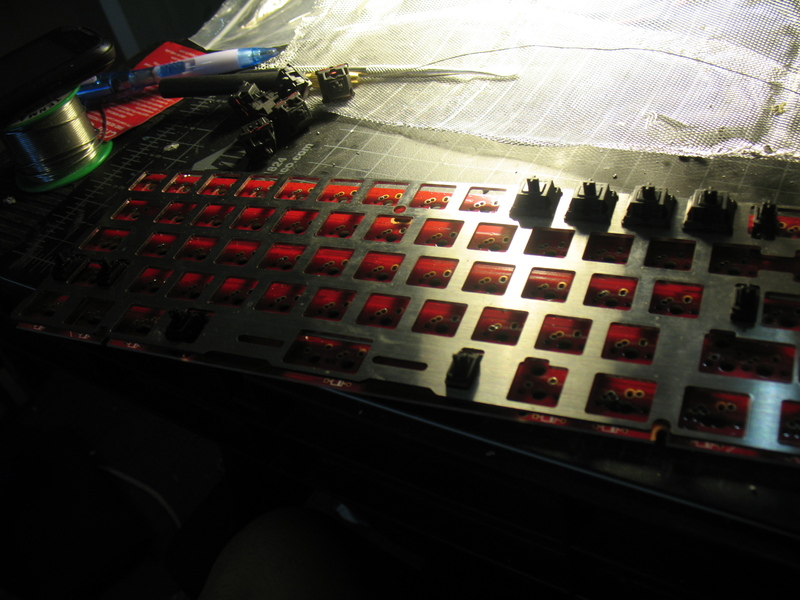 Desoldered the switches from his old build and prepped it for sockets. That's right, I had to do this twice over, and I DID. I drilled out all positions including the custom positions like in my last layout. However, this time it went by very quickly with few errors since I knew what I was doing. 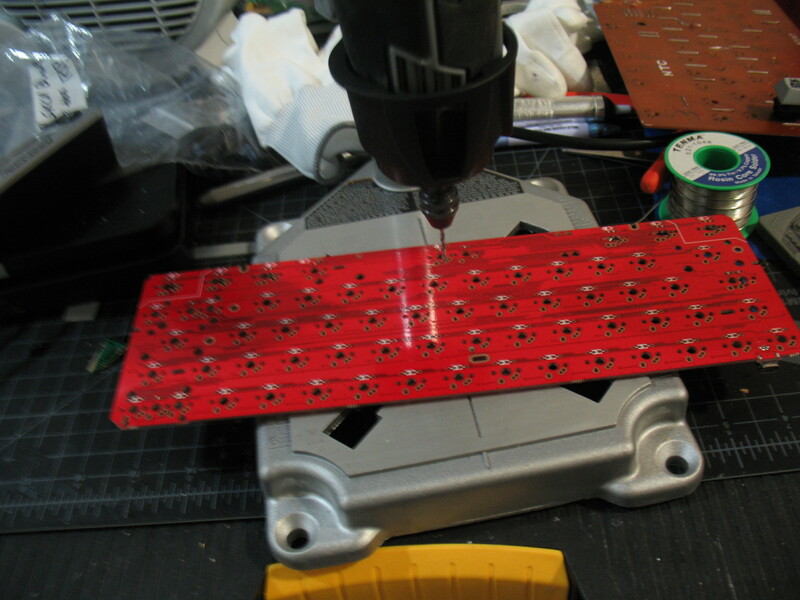 I was so DONE with all the drilling at this point, that I did not document the second PCB's build log aside from the two prior pictures. I decided to do this like a DAY before Leandre's carbon fiber plates came in, haha. Great timing! Now, onto the switch modding! I actually did this before the second PCB, but since it's a separate process, I decided to structure it this way. 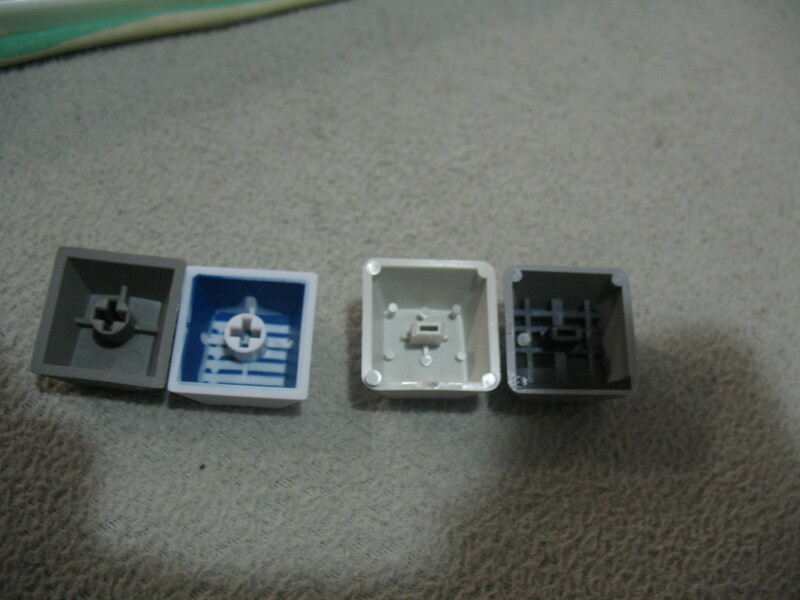 Now, even if Alps switches have LED slots in the top housing, this does not mean they will have leg hole positions in the bottom of the housing. 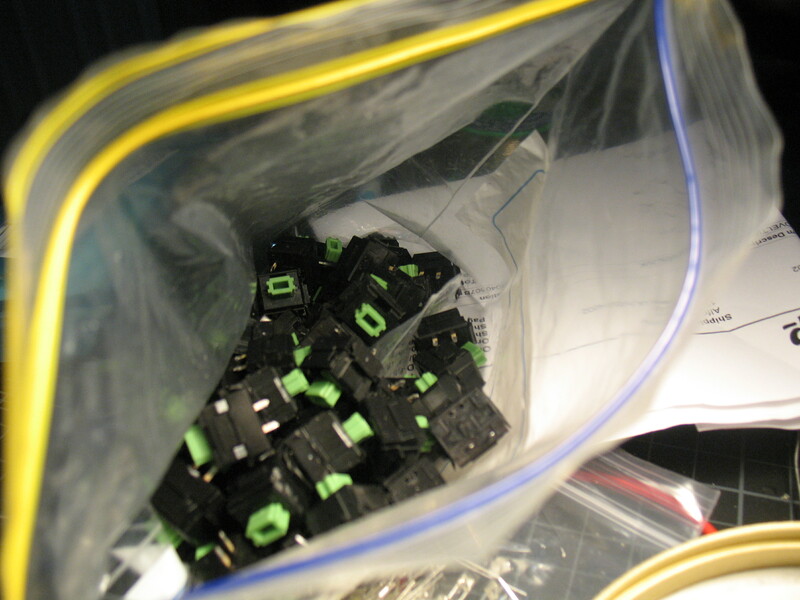 That's only for switches that came from the factory that way, usually for indicator lights. Sooo... I had to manually hand drill each one of these to accommodate LEDs. That's right, no power tools for this delicate job. Don't ask me how long it took, because I don't know. I also did this on each pass after or before the drilling. I know, it looks like I'm holding my switches hostage again. I promise I'm not. I just had to get some of that extra solder off of its legs. See? I'm helping! Down the rabbit hole of linear goodness you go! So, after a while, I finished up all the drilling, likely needing some good hand stretches after using that pin vise for so long. Oh, but yeah... Yeah, of course there's more! See, I don't really like spring ping. 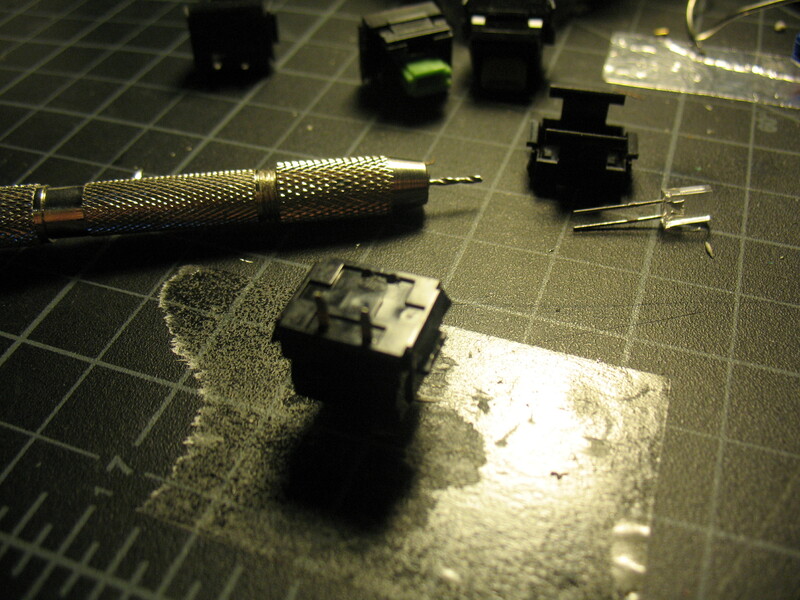 I don't like it for Cherry MX, and I don't like it for Alps SKCL or SKCM. This is also a reason I've shied away from Model [letter]s too. 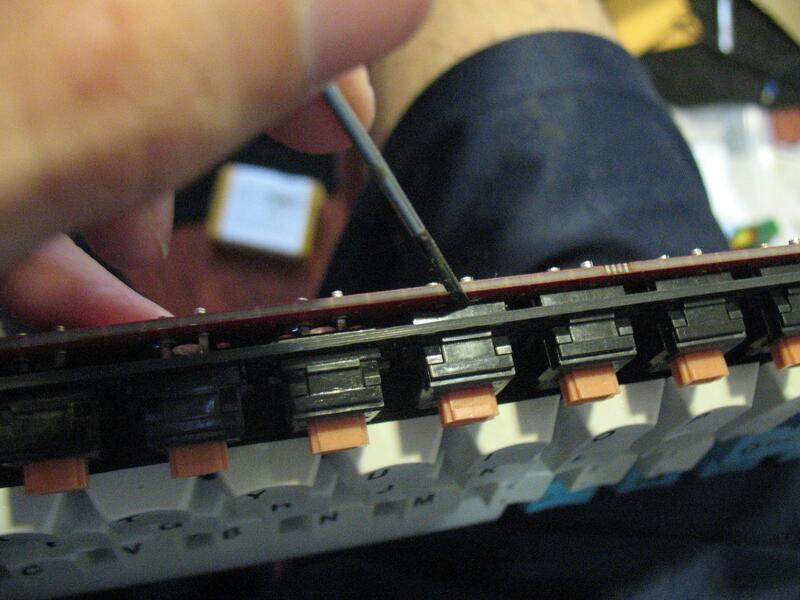 So, since I've modded my fair share of MX switches, I knew that lubing them would cut or eliminate the ping altogether. So, I spent about three hours lubing 83 Green Alps switches. Cheers. Victorinox is fantastic for anything metal in my experience. Springs are no exception. After a greasy couple of hours with lube, toothpicks, and a brush, I finally reached gratification. Nirvana. Euphoria. 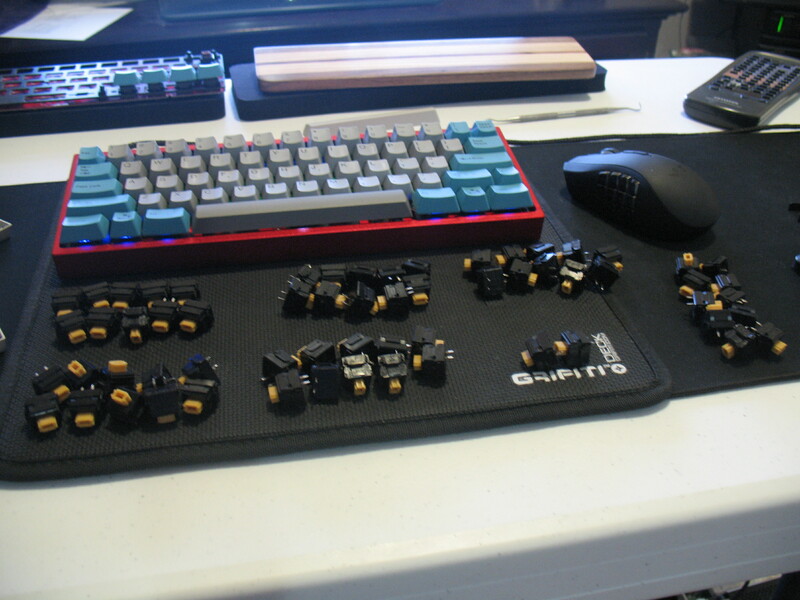 No, I just lubed some switches. V is for Victorinox V is for Vendetta V is for Victory V is for Vanquishing spring ping! I had 540 - 60 LEDs to "deflange." Of the 540 I purchased, the UV/purple ones didn't have flanges. Now, flanged LEDs of this type can still slip into the housing, but they are a little tighter and kind of "lock" in due to the flange. 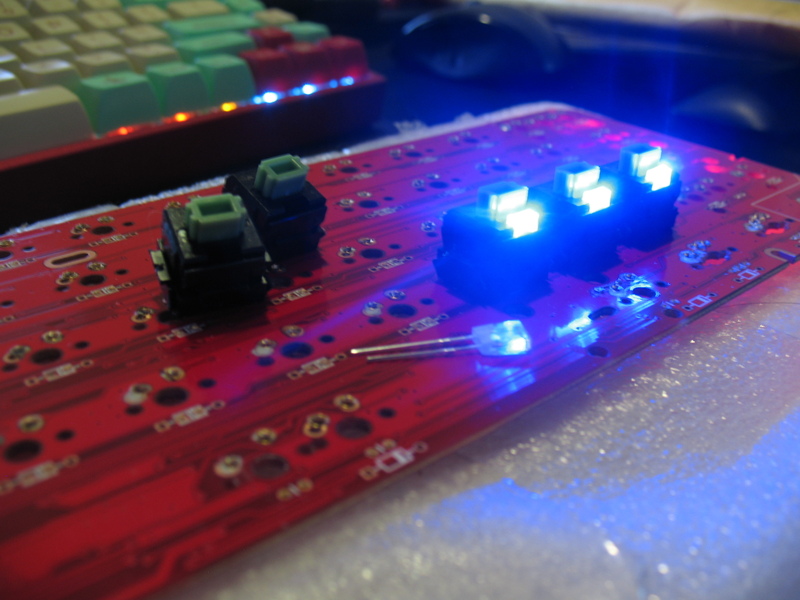 Being that I want things to be modular and don't want this to be hell every time I want to change LED colors, I decided to ensure smooth insertion and removal of LEDs if need be. It actually went by quicker than I had imagined, but it was very mundane and monotonous and man, was I bored for most of it. 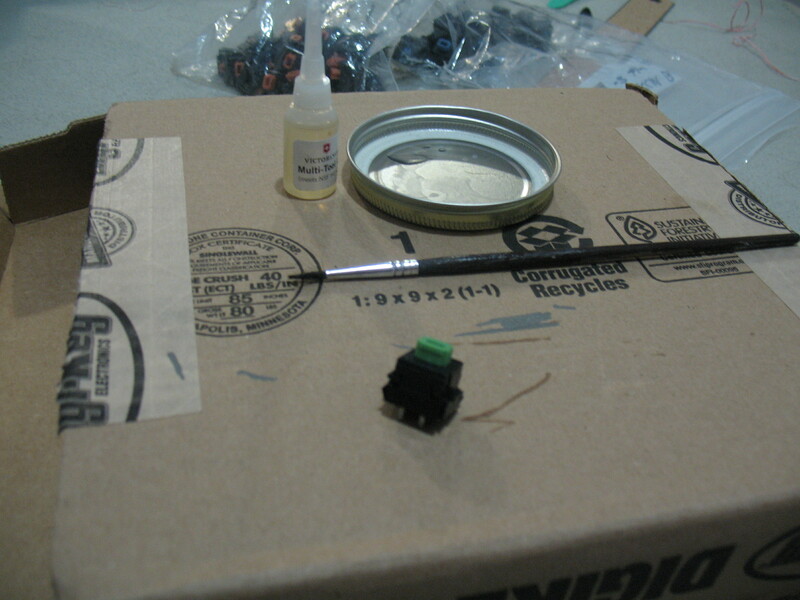 Also wore a mask for this since ground up epoxy coated my entire workbench after I was done. Two major goals and proofs of concept reached: The board works without soldering anything, and the LEDs function perfectly! We're closing in on actually having a keyboard now! Heeey, the carbon fiber plates came in! Seriously surprised me with how light they were! Only 24 grams. Much lighter than any plate I've ever handled. Well, I did mess with an acrylic plate for rainb1ood when I built his Orion v2, but the feeling of carbon fiber ANYTHING is something I've never experienced before. Welp, at this point, I started clipping stabs and lubing the wires and what not. 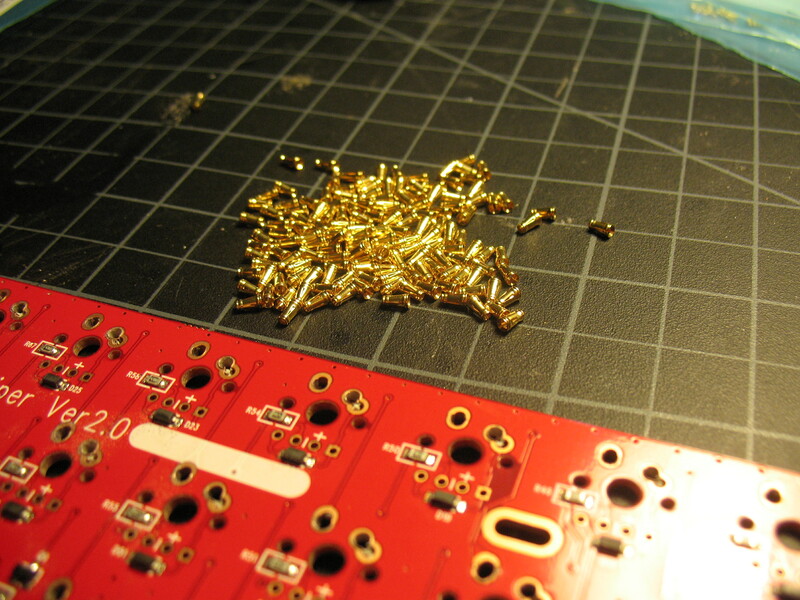 For one PCB, I used screw-in stabs, for the other, I used normal PCB stabs. Surprisingly, the Alps switches fit very snug in the plate and do not have any play in them at all! The only positions that have a little play are in the more universal areas, mainly the bottom row really. It's not much though. This plate feels more solid to me than the Infinity plate, even though they are clearly derived from the same design. PRO TIP: Always insert the switches with the LEDs installed, do not do what I did and put the switches in and then the LEDs. You won't have a good time. I should mention that the HHKB-style Eagle is using All SKCL Green Alps, while the ANSI-style Eagle is a hodge-podge, using SKCL Brown Alps for the modifiers, and SKCM Blue Alps elsewhere. 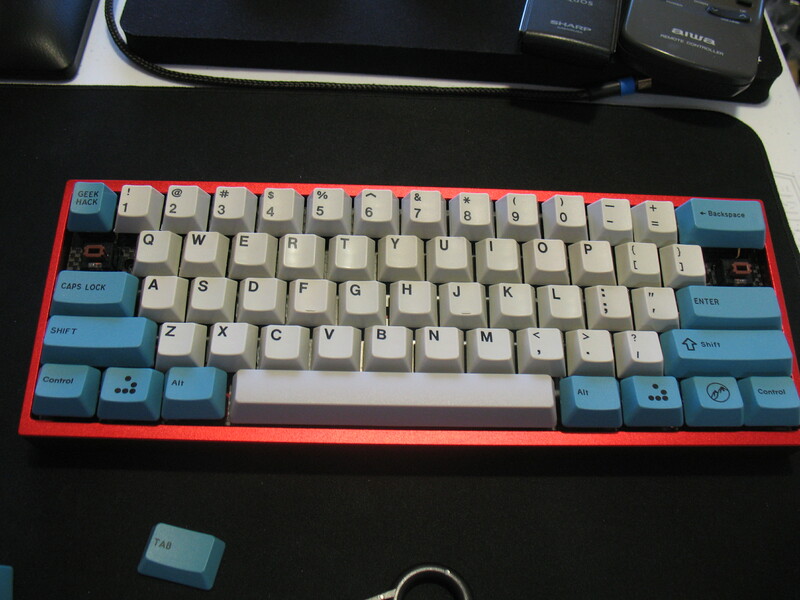 It went through a few phases of using SKCM Blue Alps for the alphas, then SKCM Orange Alps for the number row and additional keys, then I swapped orange for SKCM Amber Alps. I'm actually still waiting for the blues to come in, as I have traded the ambers away for them. I very much dislike Ambers. 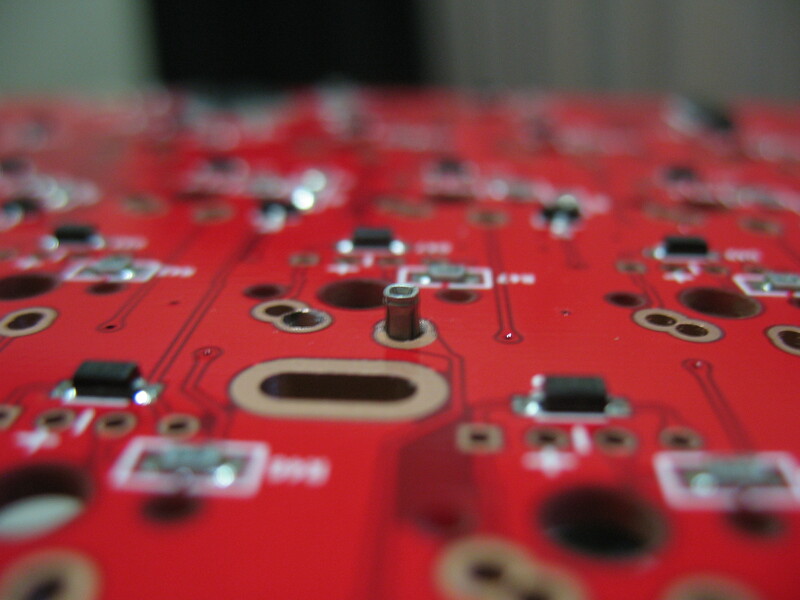 So, the PCB is done. Everything from here on is almost totally cosmetic or down to user preference! 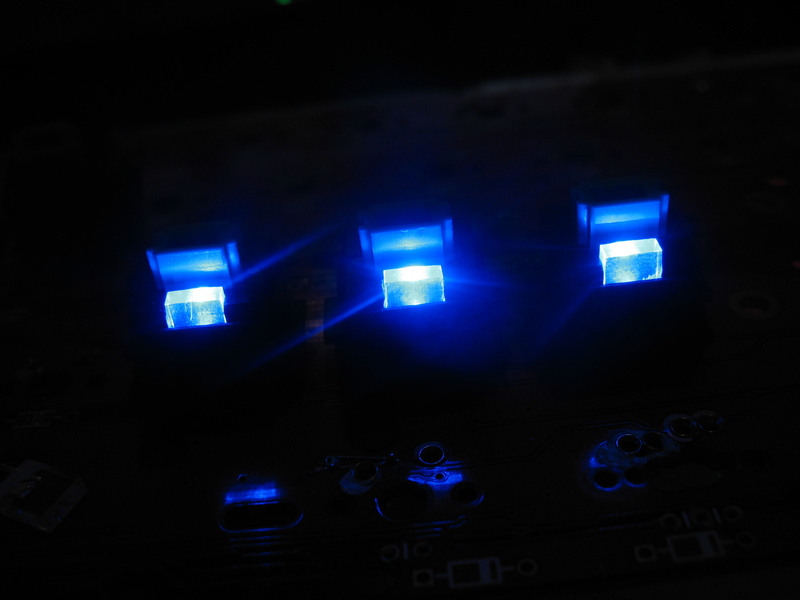 I should mention that around this time, I changed the SMD LEDs on the Eagle PCBs to blue for the HHKB-style and white for ANSI. To make accommodations for the HHKB-style Eagle, I had done a stem swap on the Triumph Adler 7u space bar that I had received from eksuen, but since it didn't match my preferred grey key cap set, I decided to ultimately use my 7u Gateron PBT space bar for the build. The TA bar will be good for Alpine Winter, as the 7u stabs on a DCS donor I had did not have proper spacing for Cherry-mount stabs. 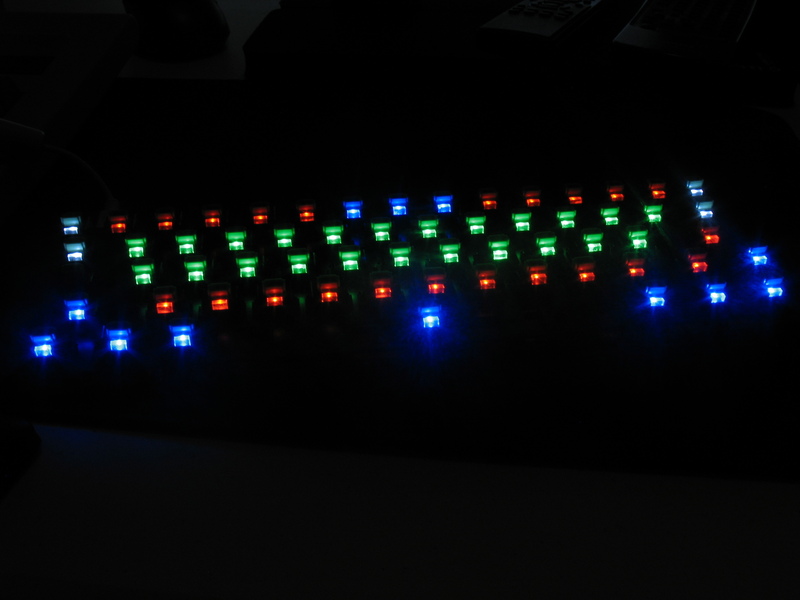 I should mention that I also painted the inside of the TA spacebar black due to light bleed. I used Badwrench's Alps DCS modifiers for the surrounding keys as they have Cherry mount stab stems and work perfectly with the PCB stabs! The carbon fiber combined with the grey and black inside of the caps I chose slightly diminished the backlighting, though I find the subtle appearance to be quite appealing and classy! For the standard layout Eagle, I decided to go with the caps I had from my NTC 6151N, which are similar to Cherry profile caps as opposed to DCS. I used the Misprinted caps from the same Mods GB to cover the mods on this build. It was around this point that I managed to grab a Hammer case, thanks to JDCarpe! But, while I was waiting, I decided to make a custom cable for the build. Being as the build was and still is focused around carbon fiber, I chose a carbon fiber sleeve for the cable. I used black shrink tube with a blue ring of shrink tube over that to give it a fun contrast. Blue goes well with the mods, so I figured why not! Two ducks, one hammer. Oh wow, that really doesn't sound right. XD; Anyway! I decided to do away with the shelf-liner sheet and replace it with the sorbothane sheet I had used for my Infinity since that board is currently not being used. Shelf-liner is great, mind you, but sorbothane... Well, it's fantastic. So, time to install the PCB(s)! 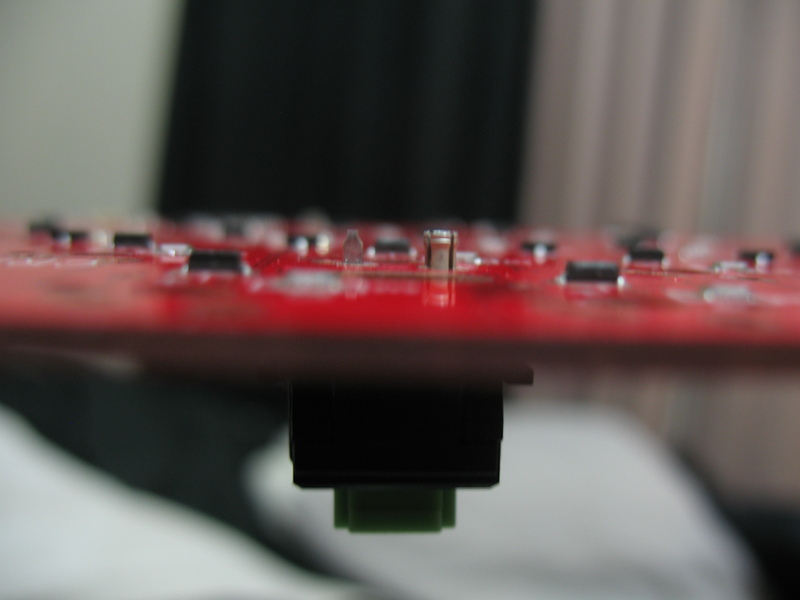 Despite the Eagle/Viper PCB having different mounting positions than a standard Poker-inspired PCB, four positions were still possible for the screws. I ultimately decided to go with only two since that allowed me to replace the PCBs as desired without having to take off stabilized caps every time I wanted to swap them out. 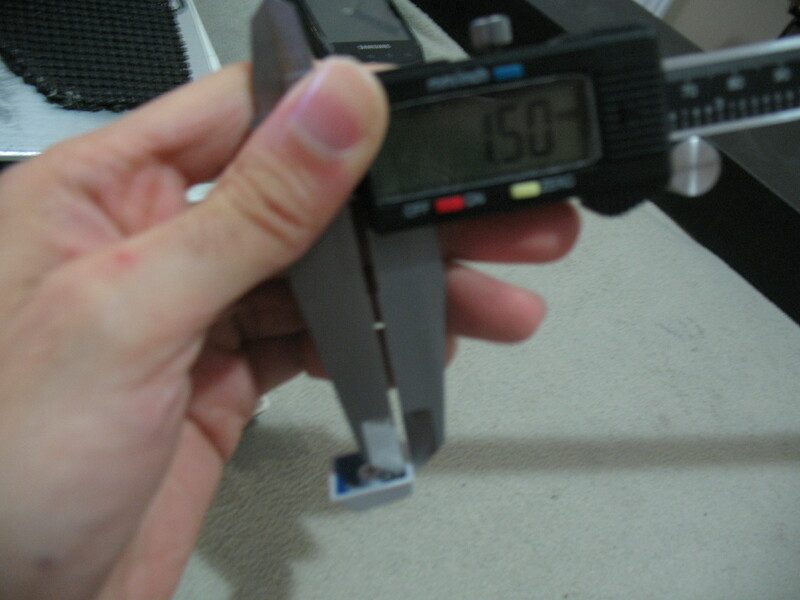 I also opted to use hex screws because a hex wrench is much smaller and gets a better hold of the screws. A huge plus, especially if you magnetize the wrench. Eventually, I plan on having each Eagle having its own case, so I won't need to worry about swapping much, but this is how I've got it going for now. 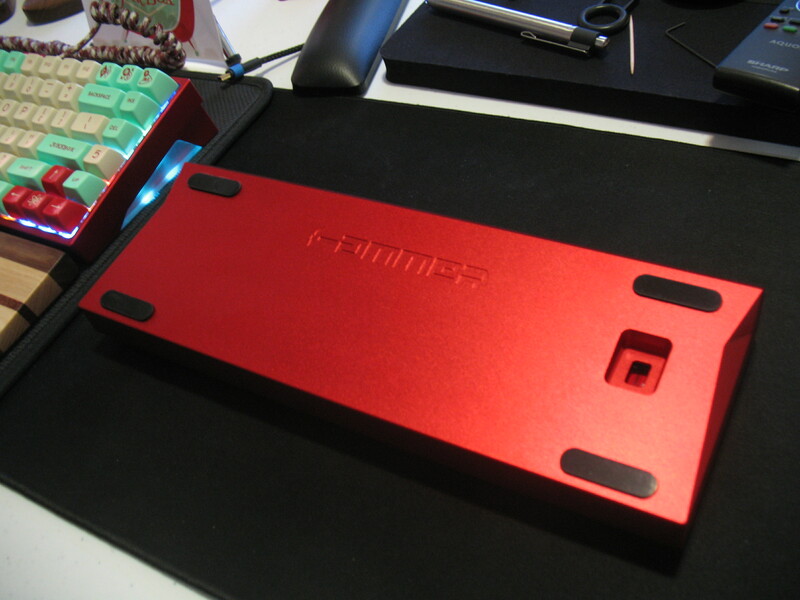 I know that blue and red are bitter enemies, but I love me some blood red cases when it comes to aluminum. Eventually, I'll have more options for modifier caps, but I like how it looks right now! I really love the grey, but the ANSI Eagle looks nice too with its sparkling white caps. It's taken so many months, a lot of money, a lot of luck, and a lot of patience and diligence to get this build done, but I am so happy to actually be able to use a board that once only existed in my dreams, haha. So, by the point I had completed both boards, a lot of my acquisitions ended up leaving me high and dry of SKCM Blue Alps switches due to trading them for the SKCL Brown Alps + caps, and the SKCL Green Alps. I was seriously missing them, but I wasn't about to salvage them from my fully functional and restored FAME. 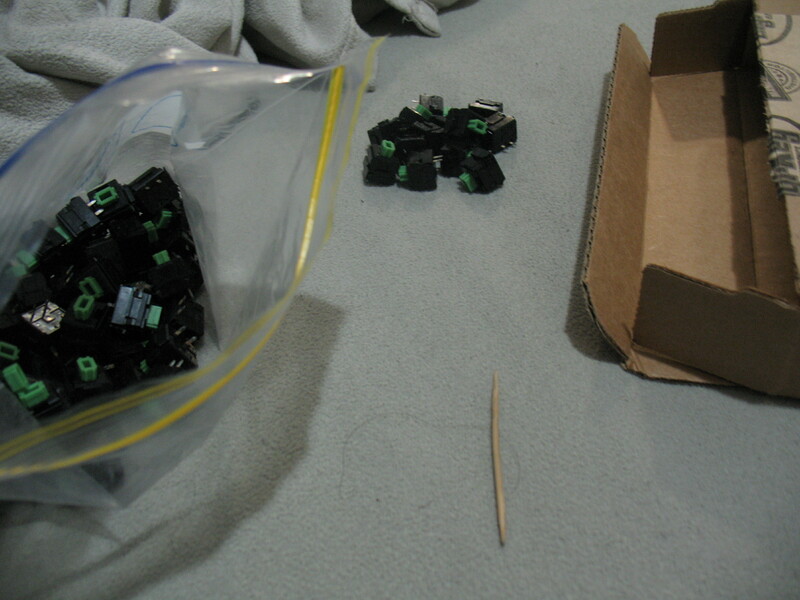 At the end, I was left with only 27 blue Alps switches. In hopes that SKCM Amber Alps really was like SKCM Blue Alps, I decided to bite the bullet and I landed an Apple IIc A2S4100 for $48 on eBay. Yep, that's Amber Alps alright! They felt really nice when I wasn't directly comparing them to Blue Alps. 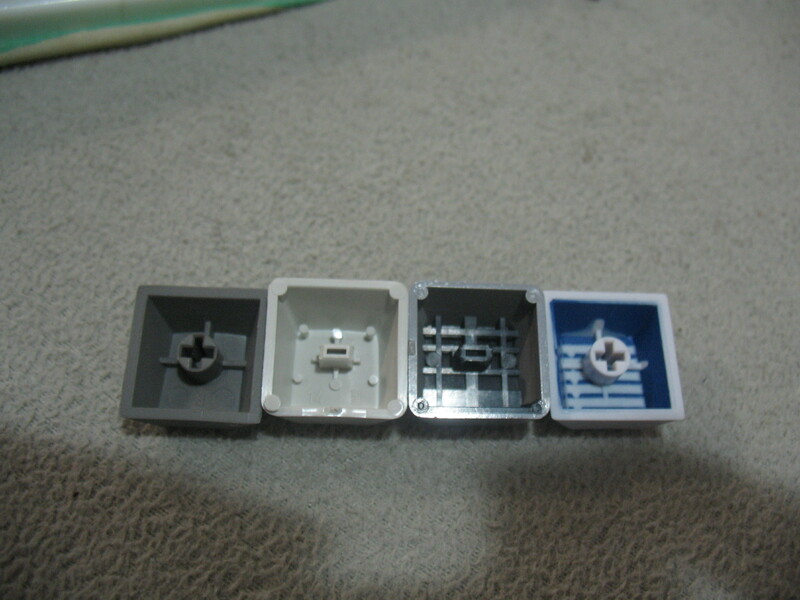 The IIc came with three Alps SKCL lock switches, which was not expected, but a pleasant surprise nonetheless! 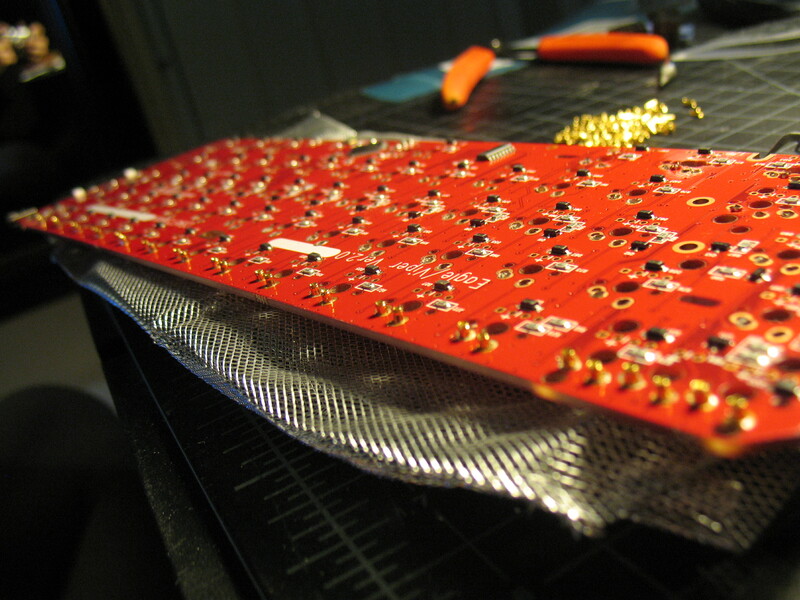 With the board desoldered, it's time to test out the hotswapping! This was a good way of getting the switches near the edges loose, but while the sockets don't exactly have a death grip on the switches' pins, the plate maintains a very firm grip, which, combined with the sockets, makes it rather difficult to pull them out. 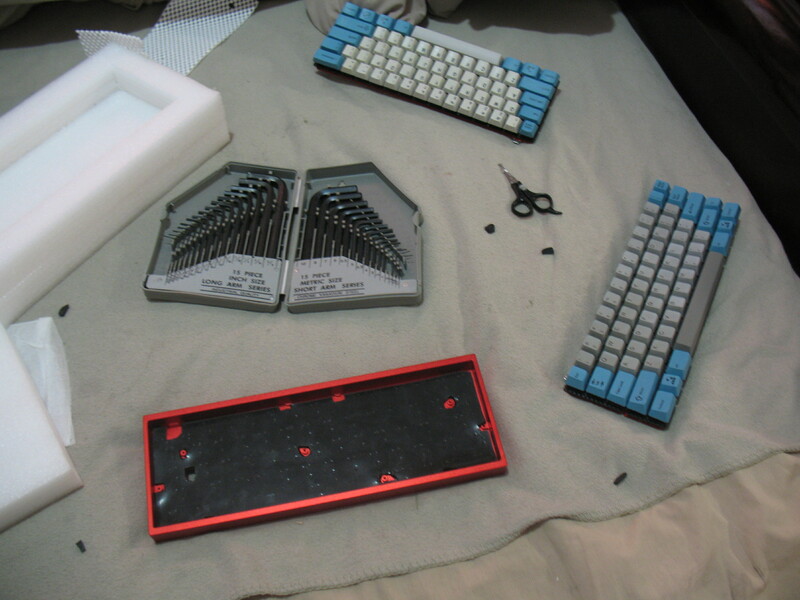 This is not an issue for Cherry MX, as it has retaining tabs that can be hooked onto with proper tools to unclip and remove them from a plate. Not such with Alps. I'm still trying to figure out a good way to do this. In the end, I did not like Amber Alps at all. I tried them side-by-side with blues, and I tried them taking up the majority of the board (mods and such use SKCL brown Alps for backlighting), but I just did not enjoy the feel. 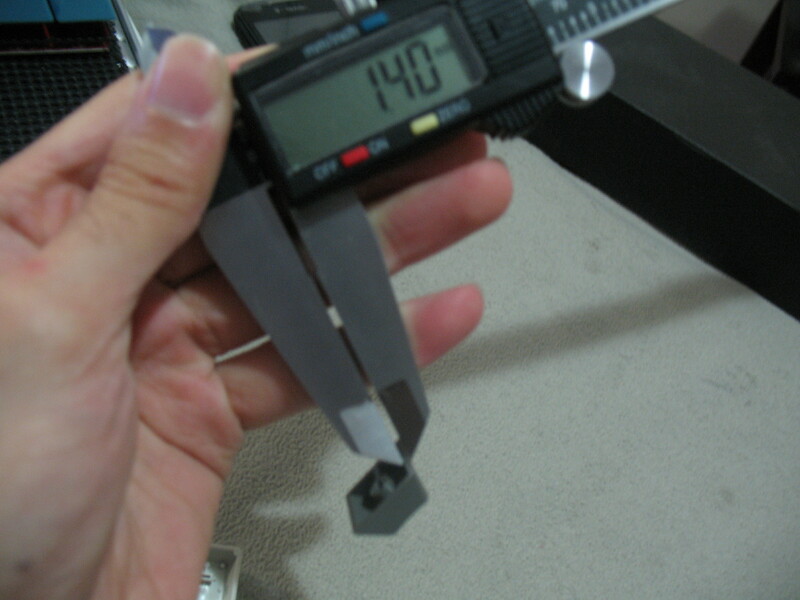 It's not that the weight is too great for me, as I had no problems with MX Green switches, it's that the sharpness of the tactility is very great. I feel as if a lot of the resistance in the stroke comes from the tactile bump itself. Once the tactile bump is overcome, there is a pretty sheer drop all the way down. 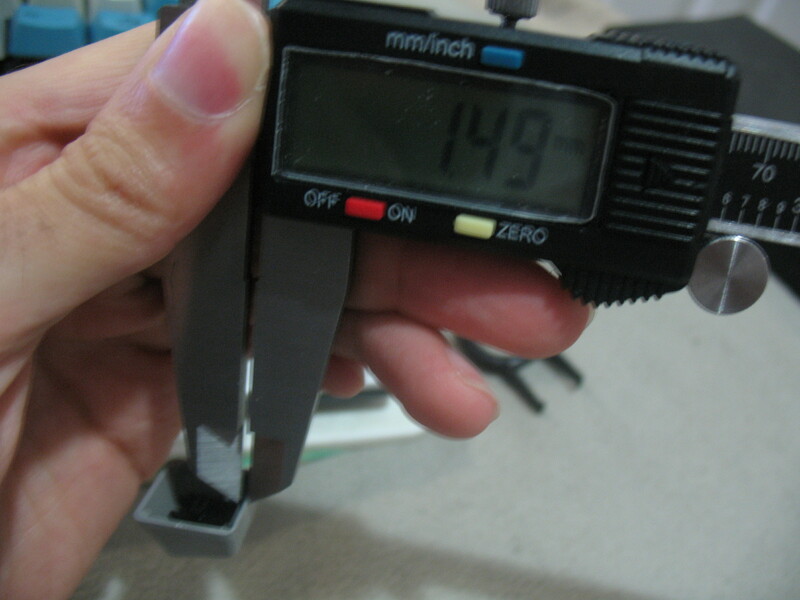 I measured these switches to be 80g at actuation. I didn't yet measure bottom-out force. The sound of the click was also not as pleasant to my ears as the click of a blue alps switch. It felt less refined and a little cheaper. Blue Alps clicks remind me of rainfall or billiard balls clacking, both of which are pleasant sounds. To me anyway. The Amber Alps' click reminds me of a ratchet or something. Yeah, not as classy, right? Ready to be shipped out and traded for blue alps! 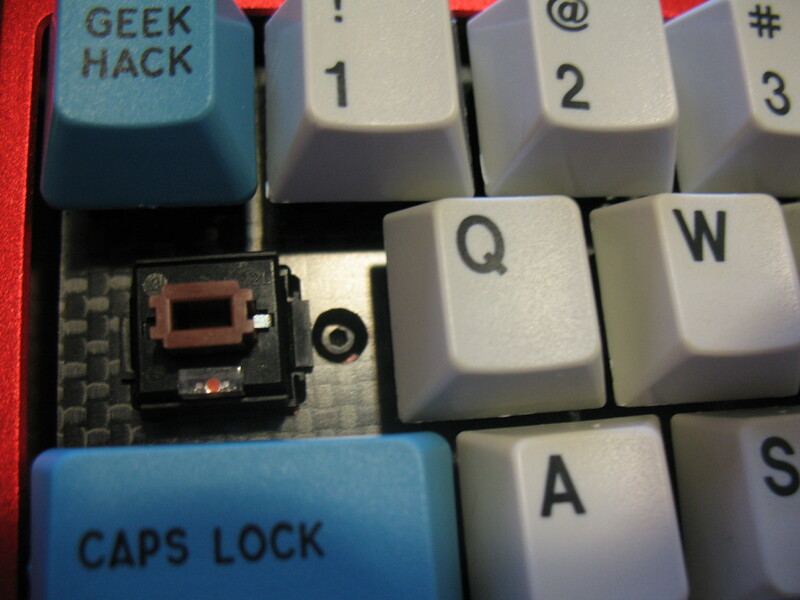 In this section, I have a quick comparison of caps that I feel are pretty much the highest standard and quality of key caps for each respective switch family, Alps SKCM/SKCL and Cherry MX. I believe the same factory responsible for the AT101 caps also produced the Doubleshot ABS caps due to very similar molding marks. 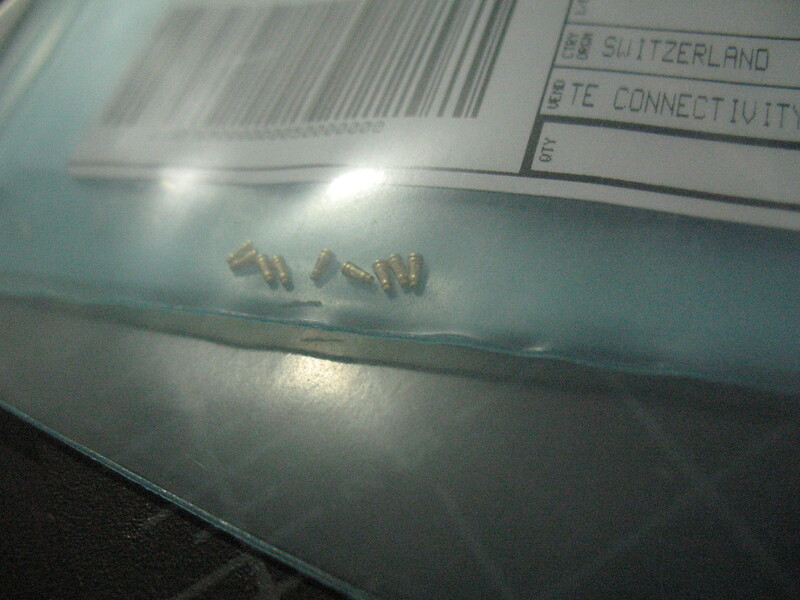 These types can be found on the Zenith keyboards, on Acer keyboards, and Leading Edge keyboards. 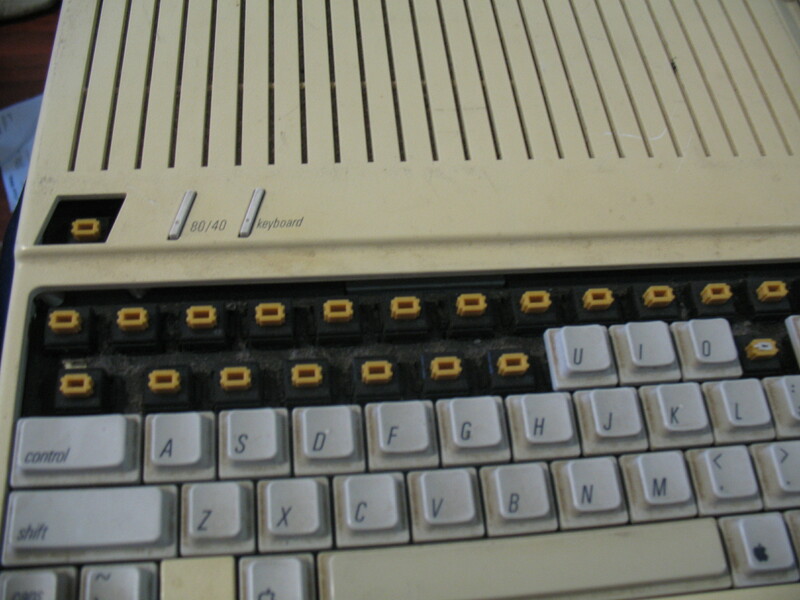 The PBT versions can be found on the AT101, the SGI Granite, the IBM 5140, and the Wang 274, and early Zenith boards. 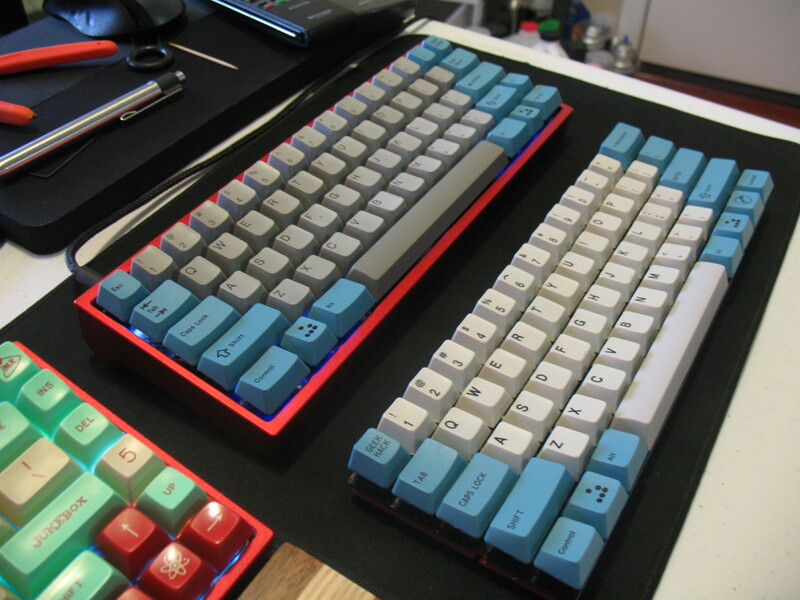 Unique profiles from the same factory are found on the AEK and AEKII. They likely also produced the "top hat" caps found on some Apple boards. Some NeXT boards also had what I think are doubleshot ABS, but I've never dealt with one before. It is my opinion that these are the absolute highest quality OG caps available for Alps. Appearances can be a little deceiving here. All of these caps have sides that vary in thickness, but the Cherry caps average a pretty even thickness all around. The PBT Alps cap stays fairly even, and the doubleshot goes from being thicker than the PBT Alps cap to being thinner by quite a bit. Personally, I prefer ABS with Alps. I feel like it accentuates the sound better, though PBT does feel nice, but it really dampens the sound. 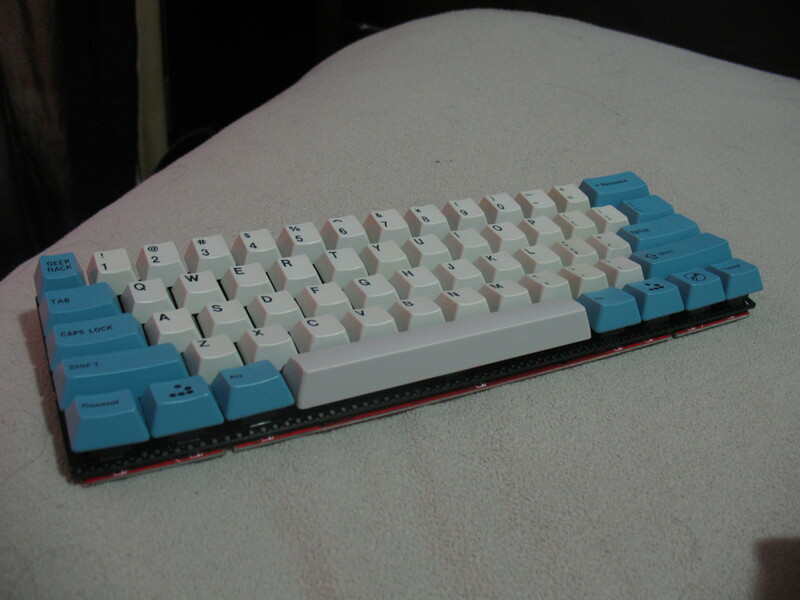 On a board like mine, where the properties of carbon fiber, sorbothane, and a heavy aluminum case already deaden the typing sound quite a bit, PBT really muffles everything. Just a sound test comparing lubed Green Alps springs vs stock. More to come, possibly, but see typing videos if you want to hear how the board and switches sound! Without these people, I would have never been able to create this, so thanks to all of you! I'd like to thank deci for being so generous in his offer for his Eagle PCB. Thank you very much! 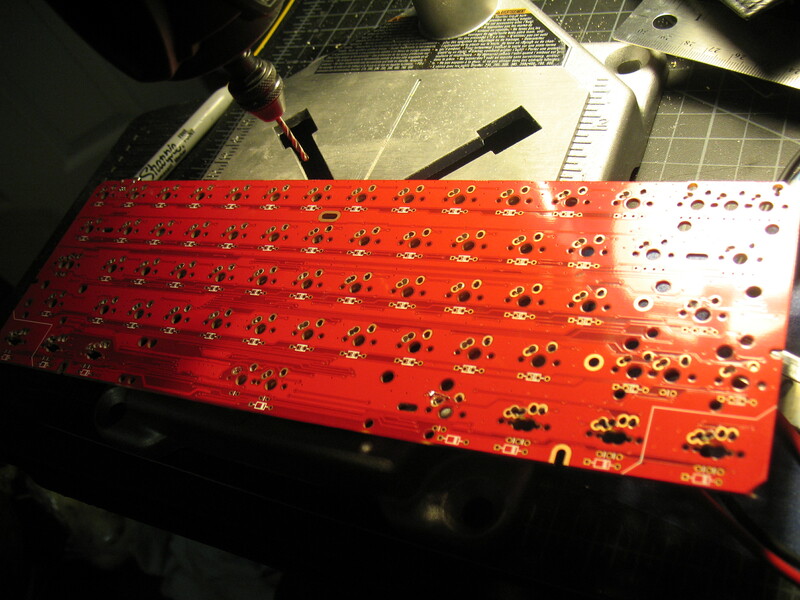 I'd like to thank bweeldreyer for providing the brand new Eagle PCB for a total of two PCBs for this project! I loved chatting about keyboards with you too, man! I'd like to thank icyskyz for helping me out with the 6.25u gold stab set and for the sky blue GON feet (which will be part of this build eventually)! You've helped a lot, thanks man. I'm glad the silver feet got to you okay. I'd like to thank Ludovician for providing some really pristine SKCL Green Alps. Hope you're diggin' the blues, even though you already have a lifetime's worth. Thank you to Spamray for helping me out with the screw-in stabs. Thanks for all your help, dude. I'd like to thank HeedPantSnow for the case I'll eventually buy from him, and for being a really down to earth guy! I'd like to thank PopReference from LinusTechTips for giving me a lot of really helpful advice when it came to the Holtite sockets. Thanks soo much, dude! I'd like to thank LeandreN for hooking me up with the carbon fiber goodness for this build. You suffered my whining and my gushing over how excited I was to use them in this build. Thanks for that. I'd like to thank JDCarpe for helping me out with the Hammer case, my dream 60% case. Another thanks for helping with the LED issue I had on Sed80p8's CTRL ALT GON build and for the awesome plate designs! I'd like to thank sth for the Alps SKCL Brown switches and the Grey doubleshot caps. I love them both, man. Hope you put those blue alps to use! Thank you njbair for running Alpine Winter, as I'll certainly use those on this build! I'm grateful I could have a part in the design. Thank you to Badwrench for his modifier group buy, because without those, this would not be possible. Okay, so I could have stem-swapped, but still. Thank you, man. Thanks to geniekid for letting me buy into that GB in the first place by selling his extras! 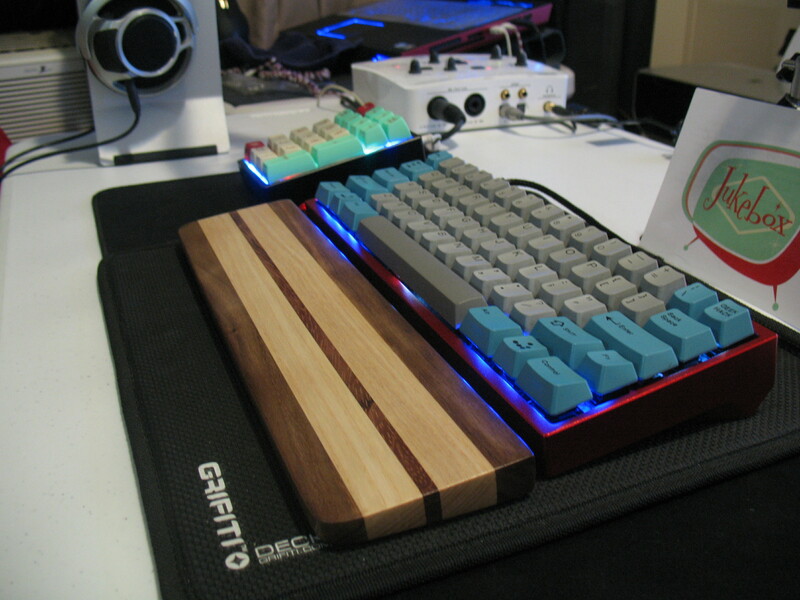 Thank you to eksuen and jerue for hooking me up with some 7u spacebars from the freestuff thread, and thank you again to eksuen for the V60 case, although the PCB+CF Plates did not fit in the case, unfortunately. If anyone has been missed, I apologize! Thanks to all the component manufacturers as well, haha. Couldn't do it without those guys! Nice! I'm looking forward to reading it! Also just happy that someone else is on GH at this hour. Lol, don't tell me those more buttons don't work! Thanks, man! It took a hellovalong time to both build the board and write this. Haha. I'm pretty spent! I've been pondering the same kind of hotswappable build myself. I like it! Oh, were you gonna try hotswappable Alps too? Good luck if you go for it! It's definitely rewarding if you can get through all the steps needed to make it work. Not sure if I'm still going to do it, just something that I've kept bookmarked. This is something I'm going to pour over a lot before I build up my Eagle since I too was thinking of going with ALPS for that build. This build makes me happy. Great job and thanks for sharing! Top quality post, and another Alps lover among us is always a good thing. I like the commitment towards making the perfect board for yourself. It really came out beautifully and your post was very informative. I'd love to hear more of your thoughts on the brown alps and what difference the lubing made in your opinion. Damn! This is a really nice build!!! 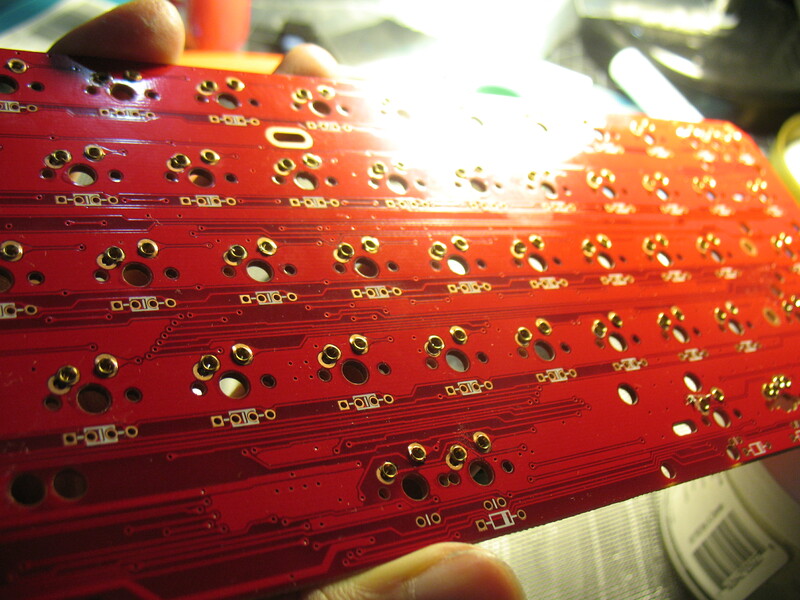 Very impressive work on the pcb and the back lighting! Great build log as well! Wow, you really worked your arse off on this project. Congrats, and enjoy the fruits of your labours! Here comes a mega reply! Don't let it deter you if you have anything more to say. Thanks, man. Do keep us up to date on where you go with that build. Not many seem to have used the Eagle with Alps, likely due to a lack of a plate, but now that the Alps Party GB happened, there are options! Thanks, man. Love the plates! Oh yeah, that'd be a cinch in comparison! The most difficult aspect to that will likely be just setting the receptacles in the switch positions, haha. Not too hard, then just push them in with a snubby soldering tip. 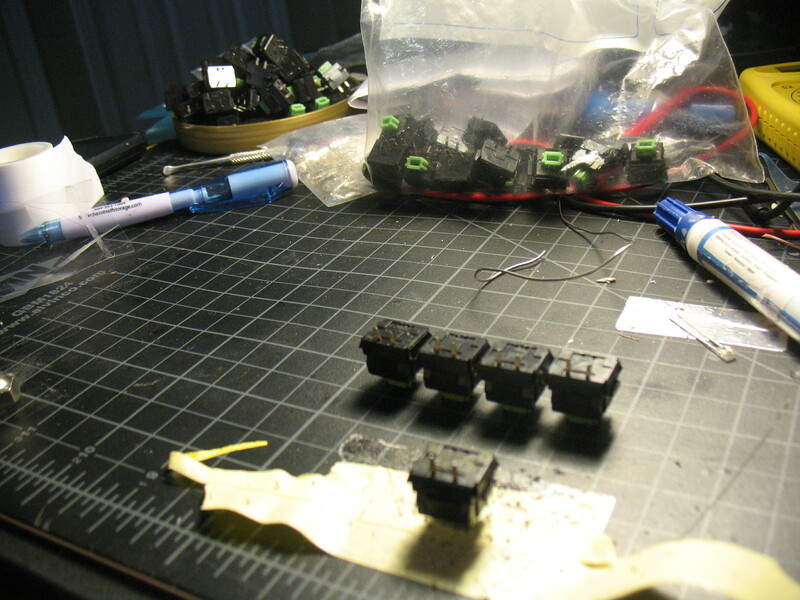 I plan on using these sockets again for the Octagon v2 when that comes around, albeit without the gold-plating. I've had my splurge with this build. I don't need those again, haha. Doing it with MX will be a LOT easier. At worst, a little glue might be required to stabilize any sockets that are in an odd position that doesn't provide enough support. Thanks man, it certainly was a very enduring project. So glad it all came out okay in the end. I definitely had a few scary moments where I felt like I ruined everything, but I managed to pull through. I need to figure out how to do a write up on that kind of stuff without it being just a stub of a post. 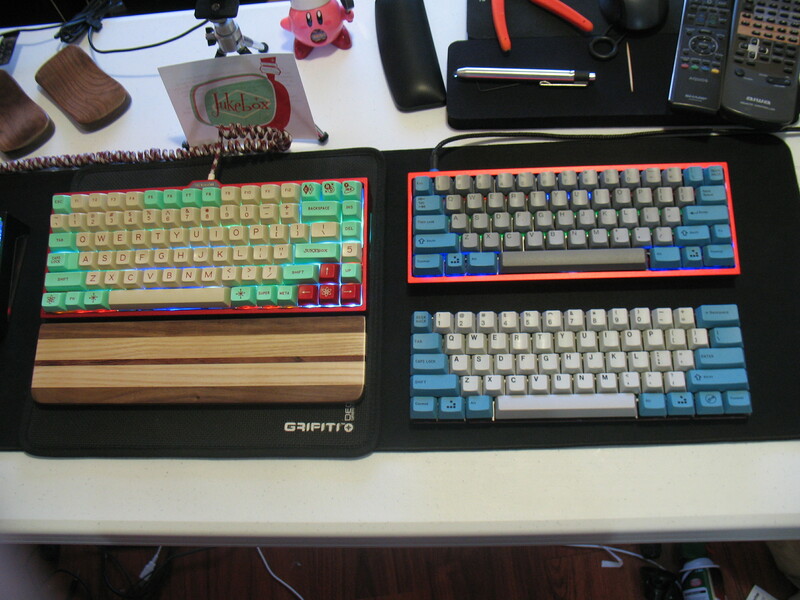 To sum it up for you here though, Brown SKCL Alps are to MX Blacks what Green SKCL Alps are to MX Reds. They're pretty much heavier SKCL Greens. Greens actuate at around 45-50g, bottoming out at around 60g. Browns actuate at 60-65g and bottom out at around 70g or so. I prefer Greens, but the Browns are just as good and perfect if you prefer a heavier linear. Yellow SKCL are just as heavy as browns through. They just have a short contact plate which results in a feel that is -slightly- less smooth. In my experience lubing Alps, I've tried krytox and molybdenum disulfide dry lube (highly recommended by nubbinator), and to be honest, it didn't make too much of a difference. 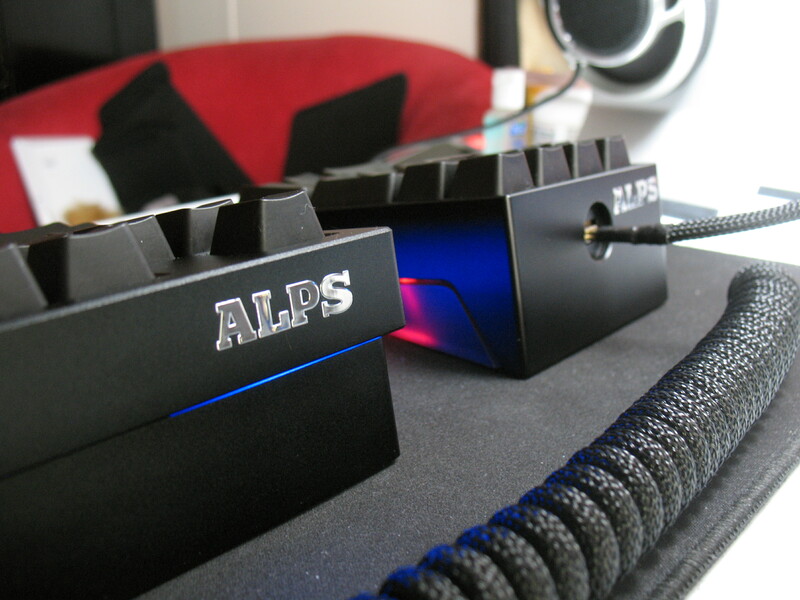 Alps are well-lubricated from the factory. Usually, just opening a switch and blasting it with air should be enough to improve the feel if it's gritty. If the lube has deteriorated though, then lubing it will definitely help, but I don't think there's much improvement for switches that are already in good condition. 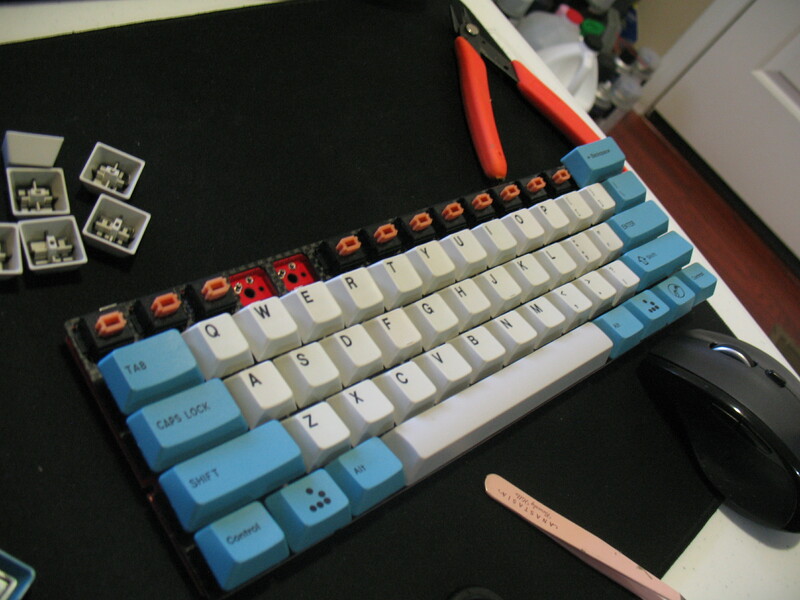 This is where Alps SKCL/SKCM is significantly better than Cherry MX. Speaking as someone who always lubes their MX switches, Alps match the feel and then some. Aww, thanks Cap'n. It was one hell of an undertaking, but I am really happy with the result and I'm glad I decided to make a photolog of the build! Definitely! I hope to see more backlight-ready Alps boards in the future. I know some are torn between being for backlighting or against it, but the option is always nice, since backlit boards do have the option to disable the LEDs as well. The hotswap thing was done on a whim, but I was inspired by both that LinusTechTips post and the Smart68. Looks like this happened before the 68, haha. Damn. Thanks Deci, I really appreciate your help! Lol, yep. It was pretty tedious and I came so close to feeling like I really messed up a few times, but thankfully I sprung back every time! Yeh, typing on it right now So happy. Haha... I think I'm gonna hold onto those. Added sound test section w/ spring ping comparison for Green Alps! It's small, but this was meant to be part of the log. i've been looking into building my own recently and i've been confused on how to make software to get the led's to work reactively or however i want. How did you set your's up? Sadly, I'm no programming or circuitry wizard (skullydazed is crazy talented), I just took parts that were available and modified them to be able to work for this build. 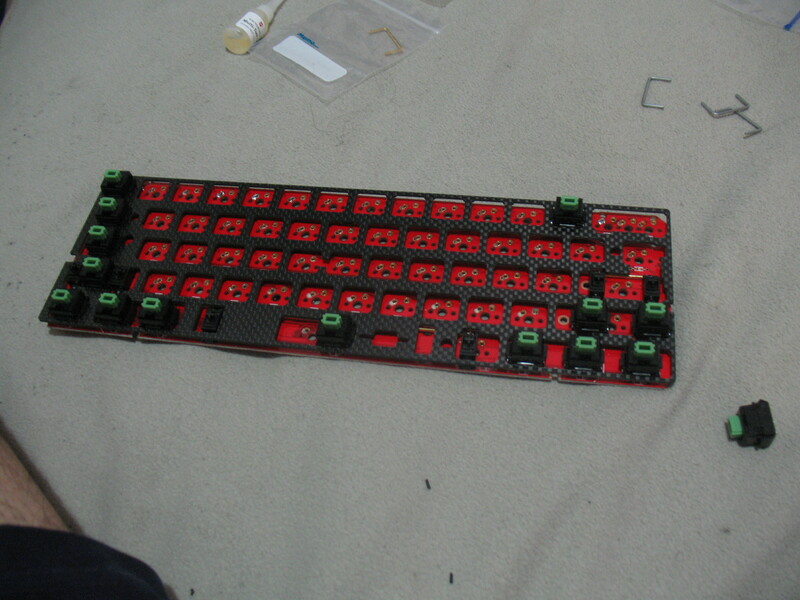 So the core of it all is the Duck Eagle PCB which was an MXAlps combo PCB that allowed both switch types. The accommodation for MX meant there were also LED positions, so it was a prime candidate for my build. The firmware allows for a fair amount of lighting modes that I'm happy with. I've seen someone mod their Gon MX Mini to have literally hundreds of modes, and sadly, I don't think they've shared how they've done it. 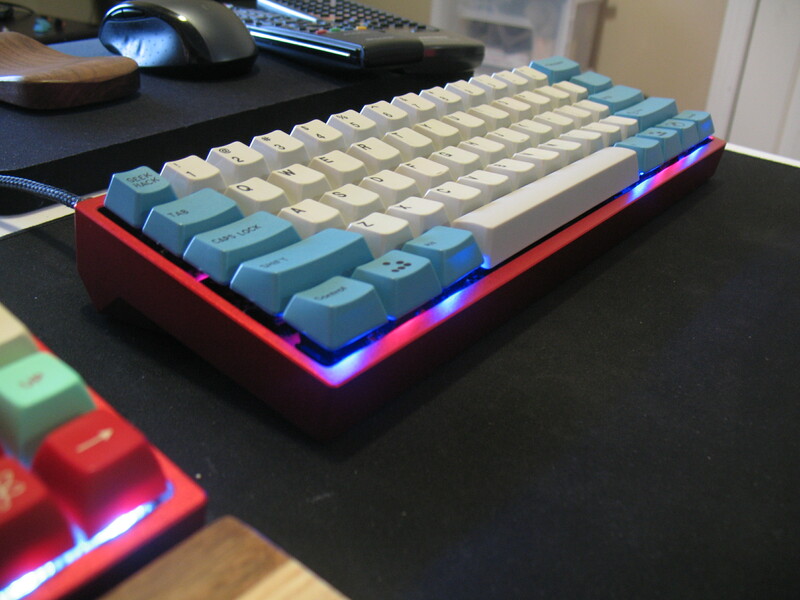 Amazing board, great build log! Thank you so much for the shoutout! I am glad that I was able to help you out! Thanks, man. It def feels really nice to come out with something that actually works. 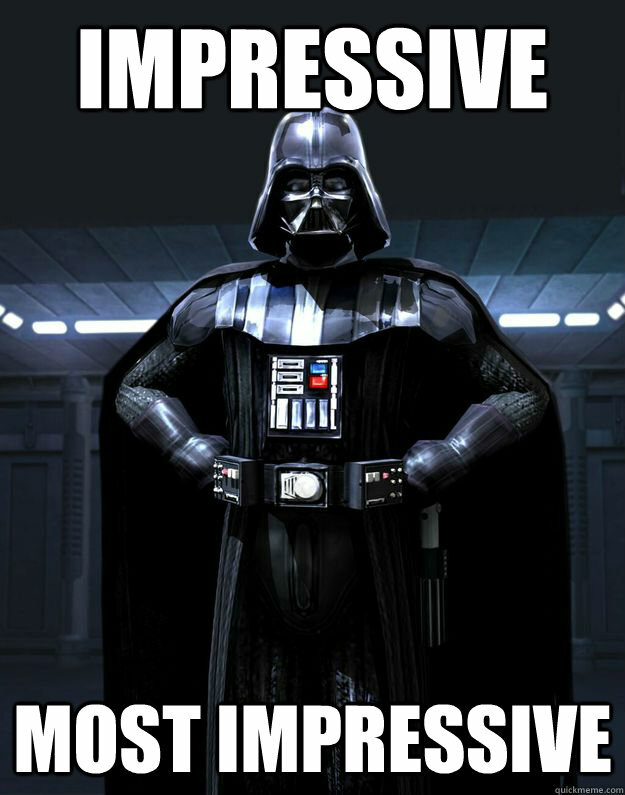 So many times did I near an utter f-up that nearly sucked away all of my morale. Even the build log took me at least four hours to write and edit, haha. 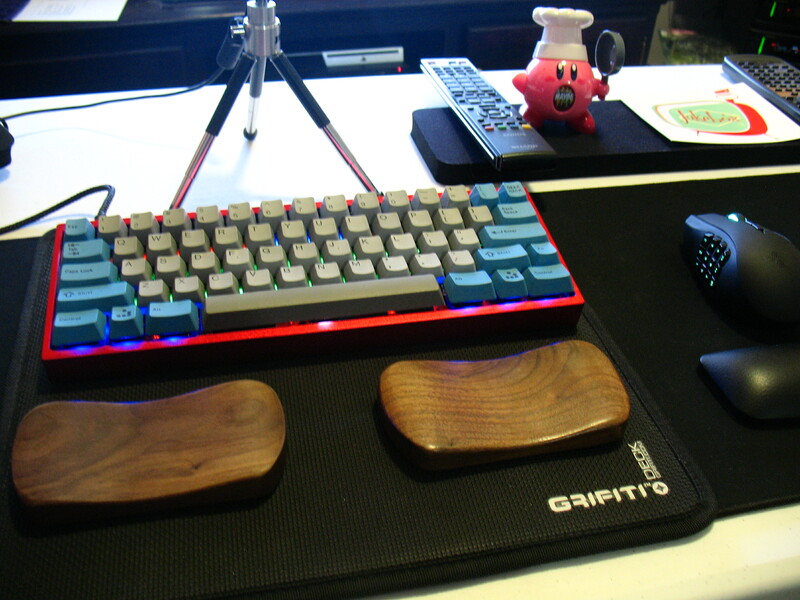 Looking forward to your wrist rests too by the way! For sure, man! Thank you again! I just had to thank everyone, even if they just played a tiny part in the build. Thank you very much, Photekq! Tiny thread update with added photos for the Acquisition section and a separation of the Videos section for typing and backlighting videos (added a backlighting demo). Hope bumping for a small update isn't frustrating to anyone. If it's an issue, please let me know. Hope bumping for a small update isn't frustrating to anyone. If it's an issue, please let me know. Wow; that is pretty awesome! Incredible work. Super glad I got to be a part of it! This looks absolutely awesome. How much use are you putting into the board now that you have an epic-ALPS? EVERY DAY! I love it so much, haha. I think it's starting to beat out the Octagon as my favorite board to use. It's really nice when you've put so much into a build and then are able to enjoy it. Absolutely beautiful builds buddy! Thank you for doing such a complete build log, I really enjoyed reading through and seeing how you did everything. Haha, yeah. Even the build log took a long time to put together, but I felt like the build deserved the write-up. It was a very enduring project, but I'm so glad I managed to finish it. I'm glad you enjoyed reading it! Thanks again for your Alps DCS modifier group buy as it was a very crucial part to this build! I love those caps! Very nice build. That took some dedication to get those holtites and pcb working with alps. Can't wait to see how your octagon turns out. I ordered the tin holtites and now just waiting for the Ocatgon GB hopefully I don't mess anything up to bad. Oh yeah, it was definitely a series of trials to get everything working 100%, especially all three Caps Locks positions and all of the positions I had to manually create due to lack of Alps support (short right shift, fn, 6.25u bottom row, and Caps Lock positions). I managed though! The Octagon should be a piece of cake since MX-sized holtites should just fit right in. That'll be a nice respite from the crazyness of this build. 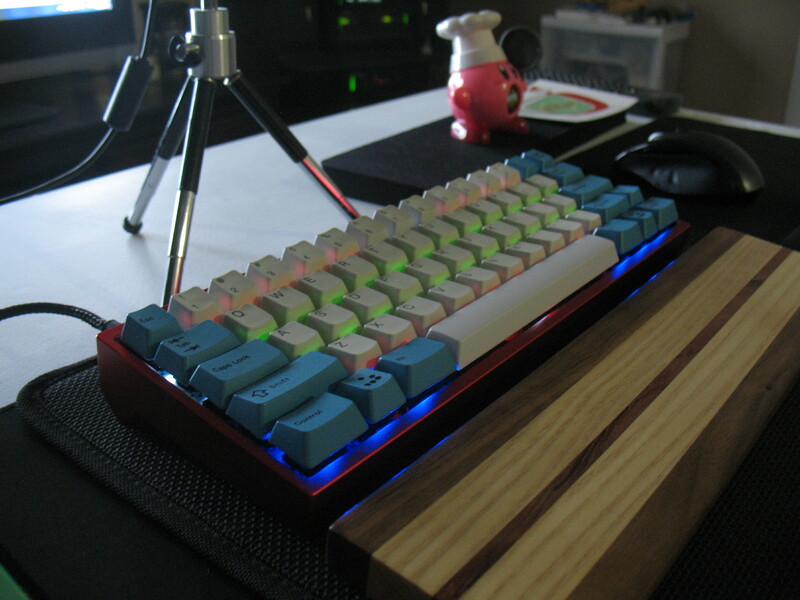 Also, for anyone that appreciates this build and would like to put a vote in for keyboard of the month, I'd so so so appreciate that. I feel bad advertising, but I'd be so psyched if I actually won. There's some crazy competition though! Please vote for whomever you feel is most deserving. I was able to get a V60 MTS-QC to try out Alps, and all I can say is...wow wow wow wow holy **** Alps are nice to type on. Did I ever mention that the JD45 PCB is Alps compatible? Okay, count me in for sure. Hehe, when I have the extra cash not to have to prioritize so much, I definitely have to expand on the layouts I use. 75% is my favorite (needs more Alps ), but 60% is growing on me. 45%? Well, will definitely consider it in the future, especially if it can support Alps! I'm a fan of the 60% and TKL layouts. Not sure how I feel about 45%. I think it might be too compact for my tastes. But I'm glad to see more and more options for Alps. 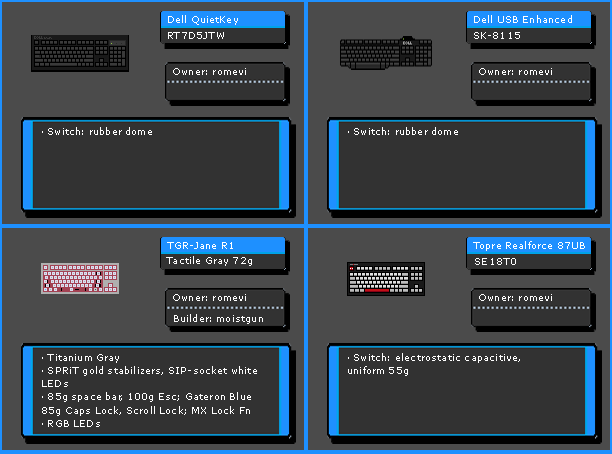 Hope you don't mind the cross-promotion, E3E, but these are the relevant Alps or Alps-compatible projects I'm working on. Not at all, JD. Getting more attention for Alps is always a good thing. It's a joint effort, really. Just saw this. Phenomenal. Tremendous. Wonderful. Make keyboards great again. Thanks a bunch, viva. Haha, the build and board itself means a lot to me. I can never stay away from it too long. It's really something that came out far greater than I had ever expected! I definitely had a lot of inspiration from others though and that is really what amounted to this. I want to see more backlit Alps builds! I would love to have a backlit Alps board, but I'm not a big fan of linear switches. 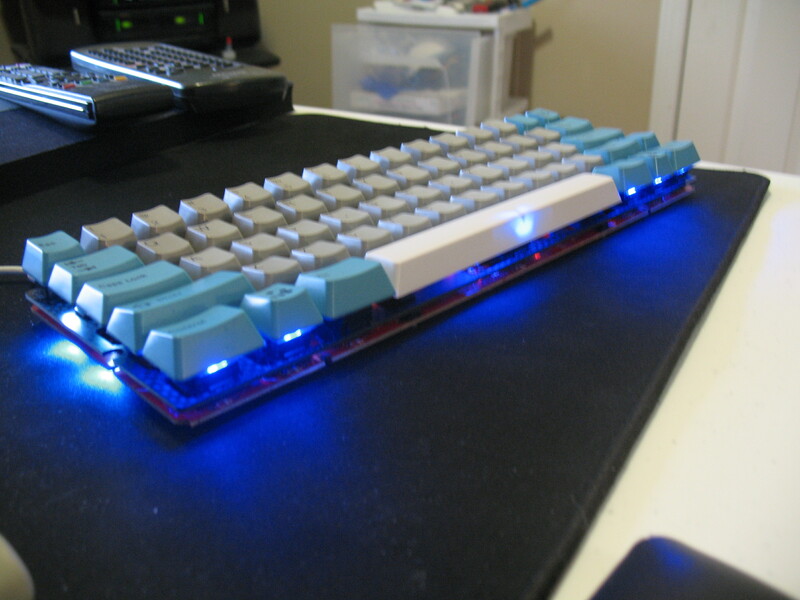 Could modding a tactile switch with an LED be a thing? If done right, MAYBE. I have thought of how this might be possible.There aren't many solutions that wouldn't affect feel, click/tactile feedback, or travel. Only practical ish thing I can think of is wedging the legs between the Alps switch cutouts, but since most plates are metal, that won't do. It'd create a short. Carbon fiber too. Aside from that, maybe if you could get the legs to be as flush as possible against the inner wall to have the lowest profile possible against the leaf, but the metal leaves might create shorts too. Maybe if you coat the LED legs first in some paint. All of this is really impractical. 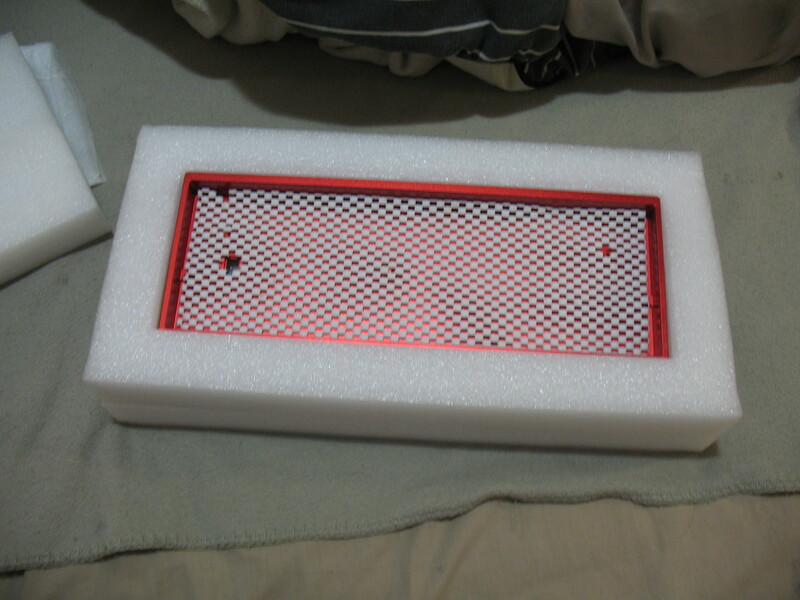 The LEDs in that case would have to rest on top of the housing and all but maybe 1.8mm LEDs would be too big. It'd be one hell of a project. I wonder if anyone has any better ideas here, at least for complicated Alps. If Matias housings worked with complicated Alps and didn't affect sound or feel (MX housings do this to a great effect, so housing is super important), then it'd be easier.